…. and then the heavens opened and it lashed down for 45 minutes. Waiting to see whether any volunteers would turn up at all, we were astonished, but delighted, to see 10 people appear through the swish of the van’s windscreen wipers. 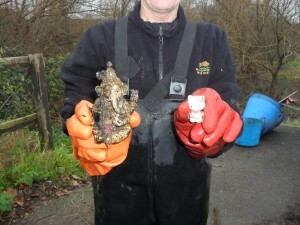 In addition, Amanda, a presenter/producer from Living Surrey – a television programme, which as its name suggests, features county interviews, news and more – had emailed to say that she would like to come and film us at work on the same day. 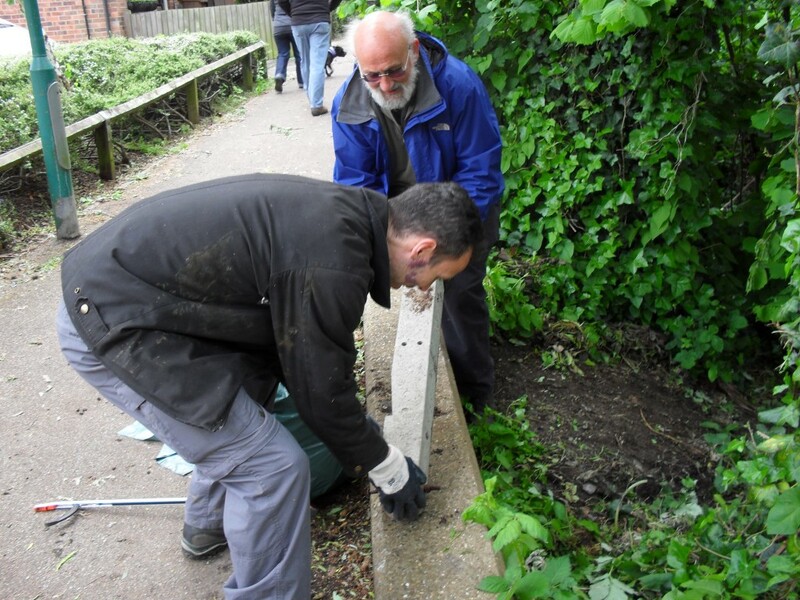 During a lull in the downpour, our hardy volunteers all decided that, as they had turned up and were already quite wet, that they would like to do something rather than go home. Hurray! 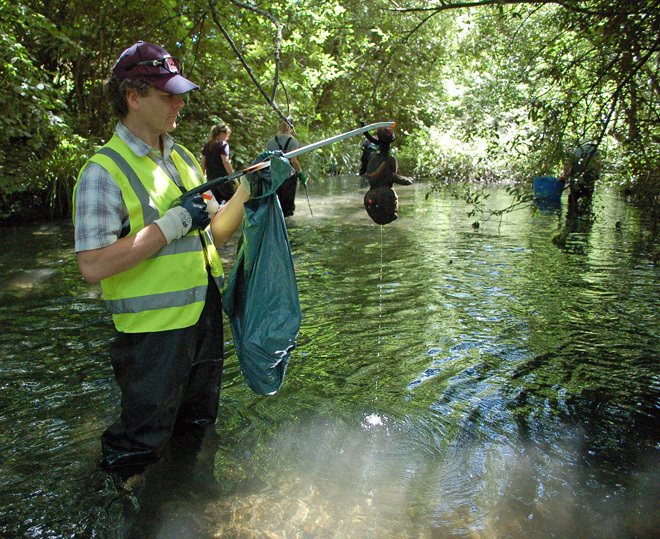 So, in a rather pared down version of our usual cleanup, we got kitted up in waders and gloves, took builders bags, bin bags and litter pickers in 3 wheelbarrows, stored all our personal belongings in the van, and trekked off into the soggy parkland to pull up the remaining stands of Himalayan balsam, spotted the Saturday before. 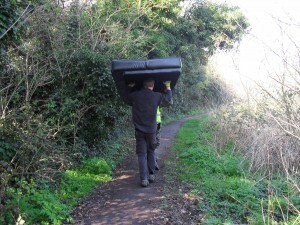 and having wheeled these to the car park just off London Road, where Sutton Council had asked us to put it, we started on the bank just by the stone and flint bridge. We were making excellent progress when we received a telephone call from Amanda to say she and David, the cameraman, had arrived. So this seemed a good time to take a break. 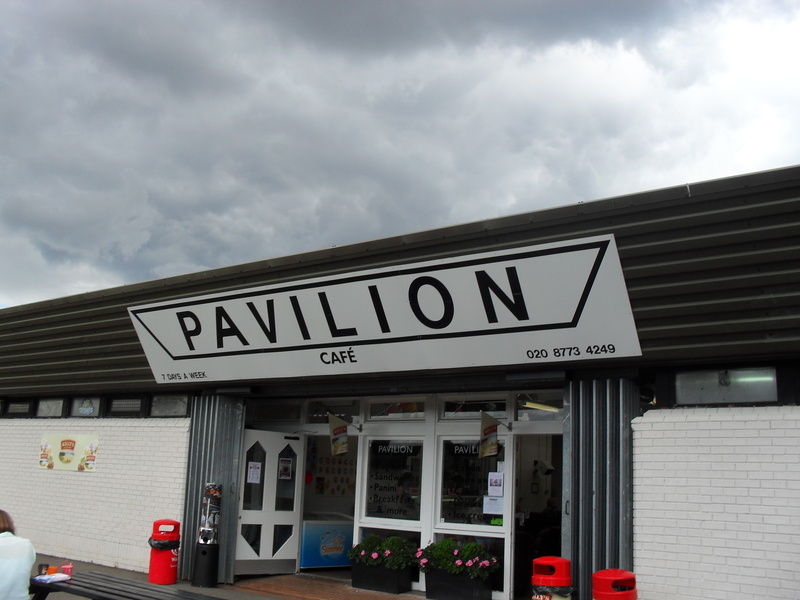 Even though we’d brought all the bits and pieces for refreshments, we decided that it was easier to take our chocolate muffins to the Pavilion cafe and buy all the volunteers teas and coffees instead of firing up the gas boiler. Amanda and David joined us at the picnic benches outside the cafe and began interviewing our volunteers, asking them what it was that motivated them to turn out on such a wet day! Tune into the programme on Sky 192 from 15th August at 7pm (or go to their website – Episode 6) to find out what they said! loading them into the builders’ bags or wheeling them all away. but not before AJ tipped out one last bag of HB on to the pile in the car park before we set off for the garage. This entry was posted in Uncategorized and tagged Cleanups, Events, Wandle on August 17, 2014 by Erica. 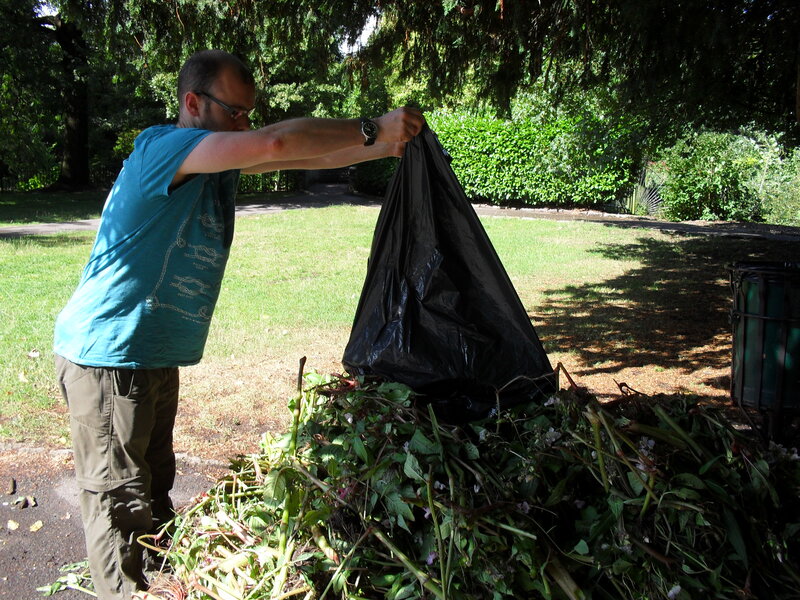 So far this summer has been good – we’ve had some lovely, long, hot days – and the Sunday of our July cleanup should have been the same bearing mind that last year we nearly expired in the heat! 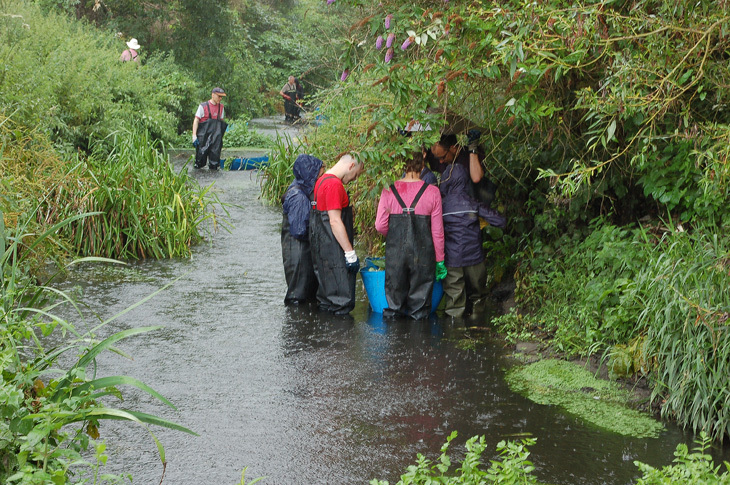 A few showers threatened, but that didn’t prevent 41 volunteers turning up to bash Himalayan balsam and pick up rubbish from the Wandle in Beddington Park. 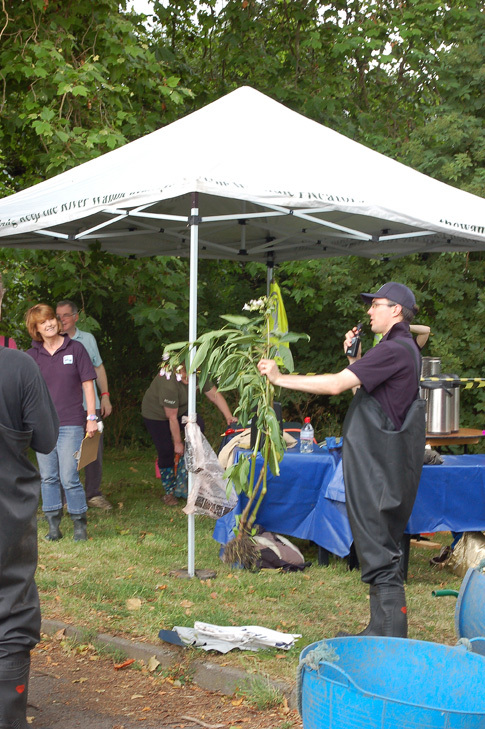 Having written an extremely good book on invasive species it was wholly appropriate for Theo to tell everyone about HB, where it came from, how to remove it and to show those who were new to balsam bashing, what the plant looked like. 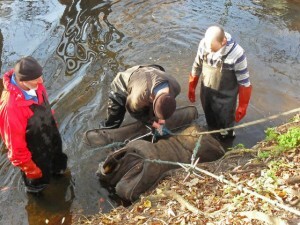 ready to get into the river and get started. 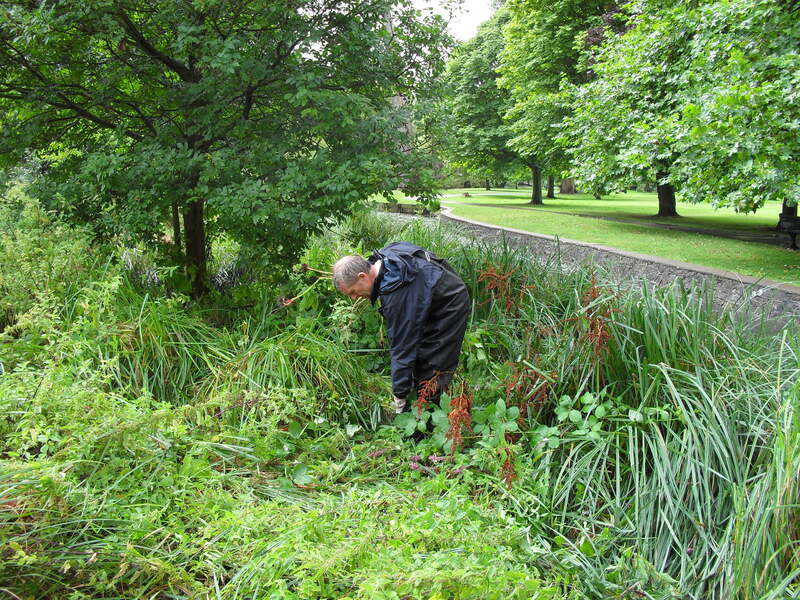 Just to make sure that we had deployed our volunteers to the right location, Theo and I went to Richmond Green, where we started balsam bashing in 2009, to see if there were any ‘stands’ there. To our enormous delight, there were none – at all! There were none either on the way down to Guy Road, none in the culvert that runs under Beddington Lane, and none in the first part of the park. 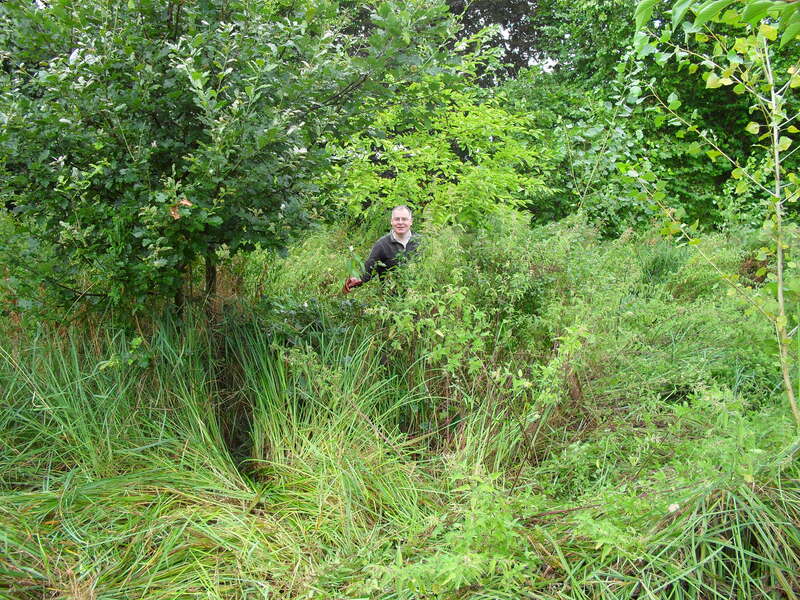 There were a few in the small ‘wetland’ which Theo got rid of, but the remainder were located on the right angled stretch where we’d sent our volunteers. 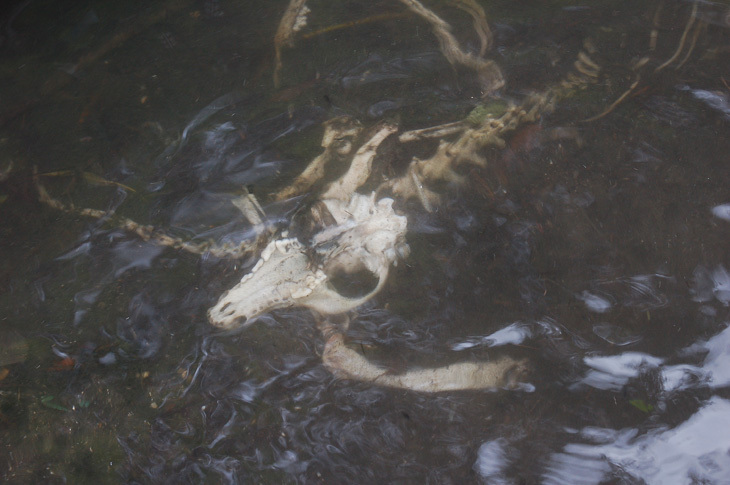 As well pulling up all the HB, there was rubbish to collect too, but not before the skeleton of some curious creature was spotted under the surface of the water! There was a quick but heavy shower fairly early on and Tim, AJ, Helen and others huddled under some overhanging branches to take shelter. 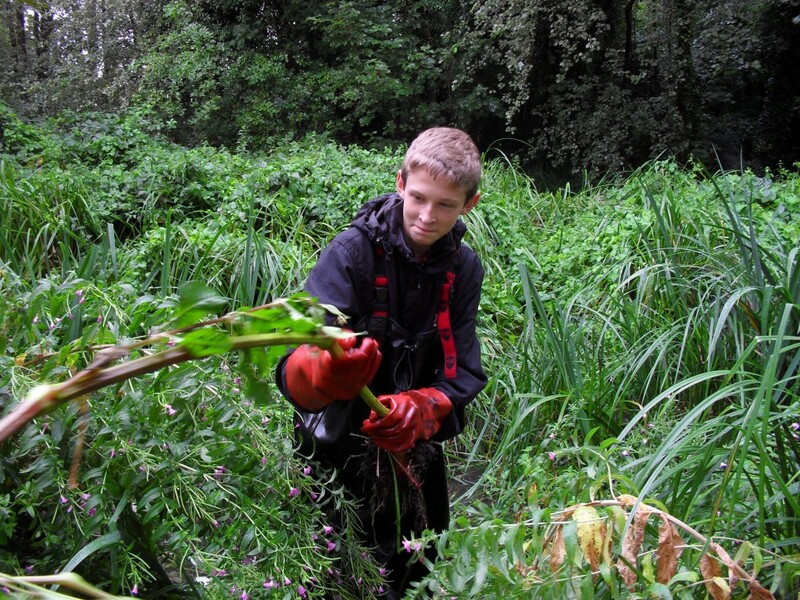 After the shower blew over, our hardy volunteers resumed their balsam removal. 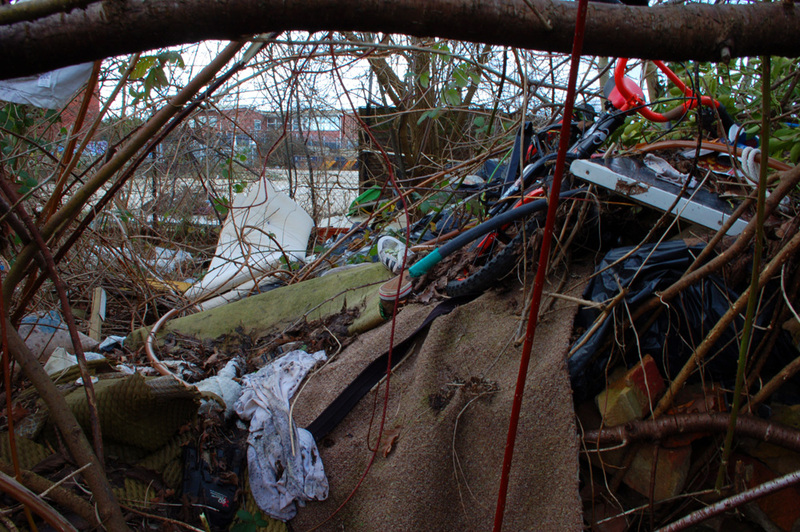 and brought back to the dumpsite located in the corner of the car park. 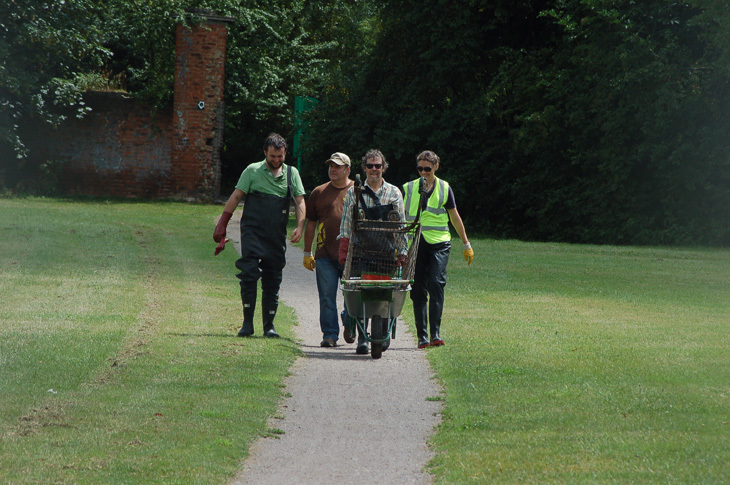 Nick wheeled this one in a barrow accompanied by Jonathan, Jez and Bella. 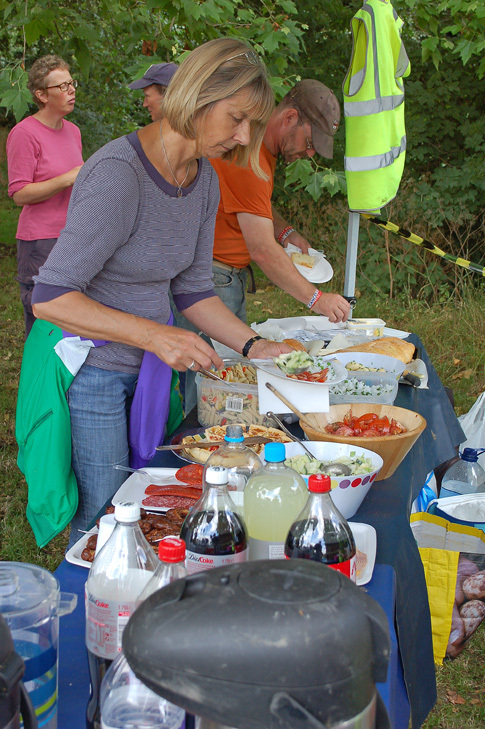 We decided work was over for the day by 1.30 as Sally and Jana called us to say that they were ready to serve up the picnic. 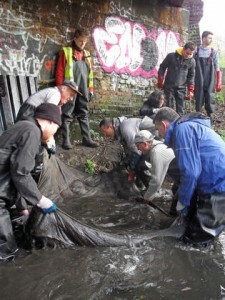 We have one annually as a way of saying thank you to our wonderful volunteers who turn out in all weathers and who work so hard to rid the Wandle of both rubbish and HB. 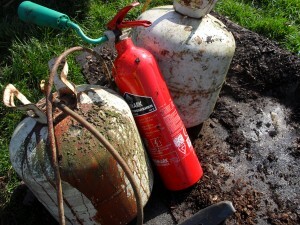 which we enjoyed whilst sitting on the grass in the sunshine. 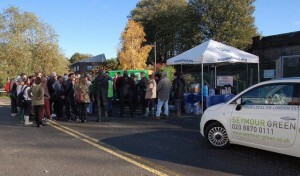 Our thanks to David of Sutton’s Waste Management Team for organising collection of all the rubbish and the HB. Huge thanks to Gideon and AJ who loaded up and unloaded the van, even though they got stuck in horrendous traffic in Colliers Wood on the way back to the garage. 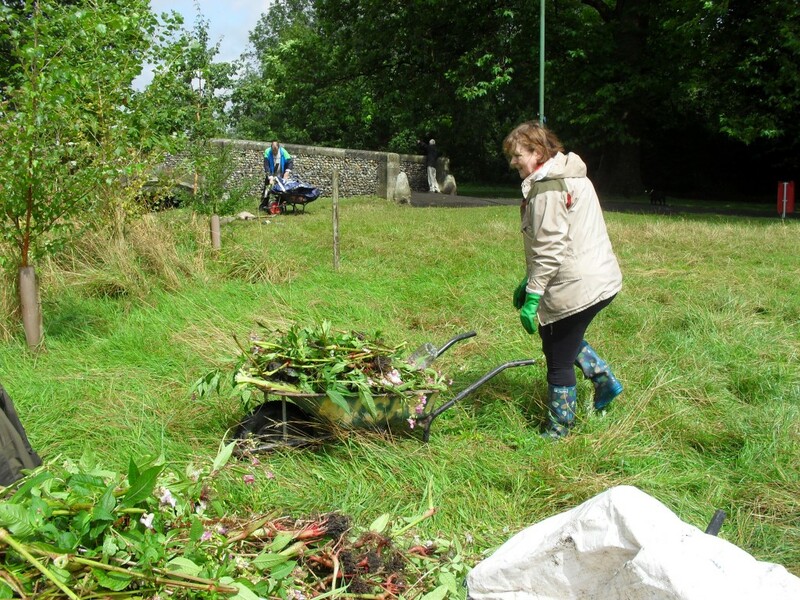 Thank you to all our volunteers: Abi, AJ, Alexandra, Bella, Charles, Denis, Eliot, Gearoid, Gideon, Graham, Helen, Ian, Jan, Jana, Jane, Jason, Jez, Joe, John L, John N, Jonathan, Keith R, Keith S, Leonie, Marion, Mark, Michael, Mike, Nicola, Nick, Paul, Per, Roger, Rose, Sally, Sally Ann, Sid, Theo, Tim, Toby and Wally. 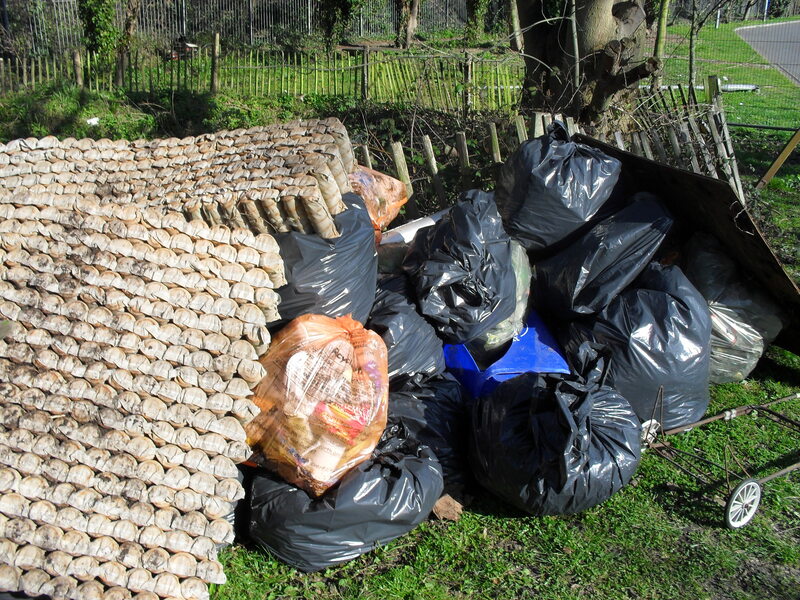 Who removed: 1 moss rake, 1 piece of chipboard, 1 ‘To Let’ sign, 1 flowerpot, 1 SuperMario, 1 set of bedsprings, 1 toy bunny, 1 folding chair, 1 garden chair, 2 crutches, 2 wheels, 2 tyres, 2 oil containers, 5 gas cylinders and 8 shopping trolleys. 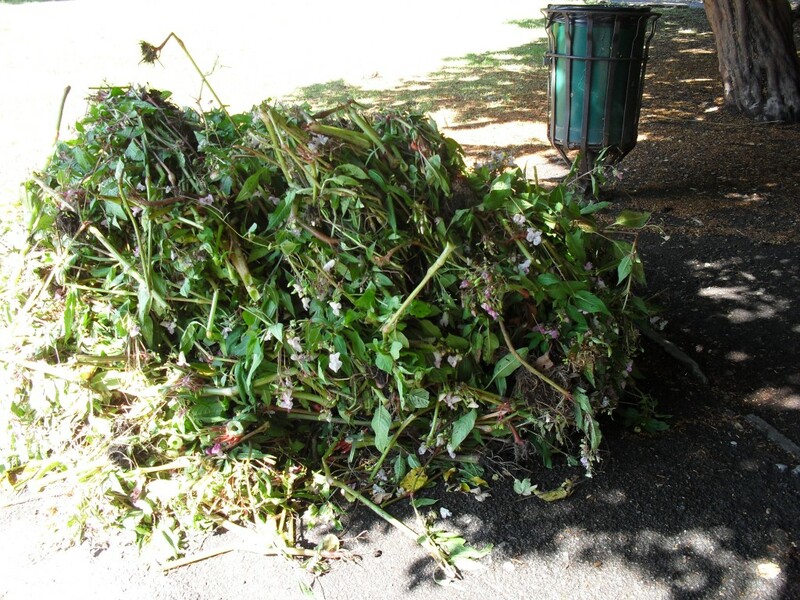 1 pile of Himalayan balsam. 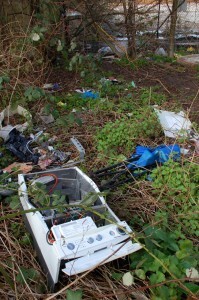 This entry was posted in Uncategorized and tagged Cleanups, Events, Wandle on July 27, 2014 by Erica. 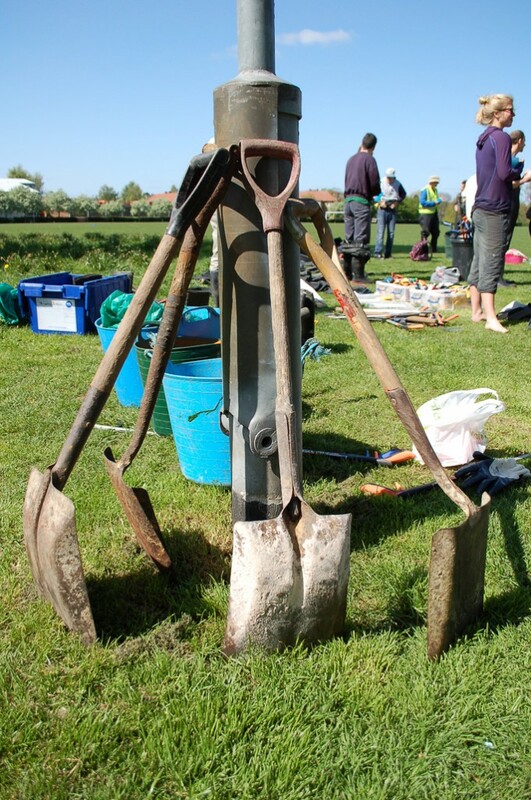 The one with the iron, the ditch and the sward-phobe! 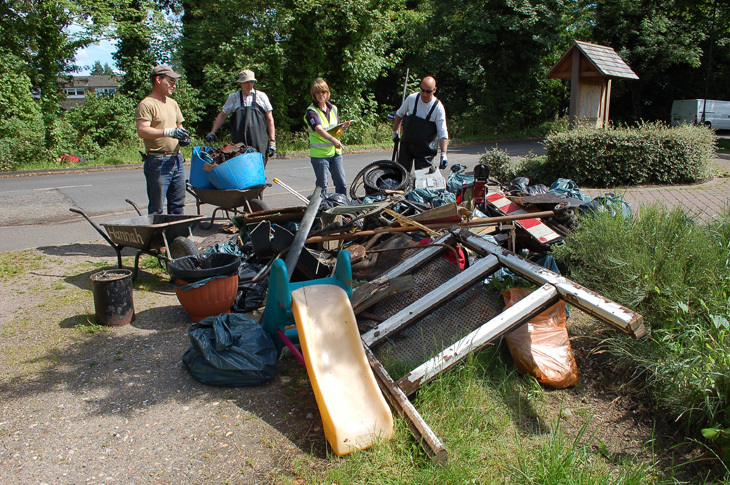 On a lovely, warm summer’s day, 36 volunteers assembled at Culvers Avenue to cleanup round the island, and to work their way up to Hackbridge Road, picking up rubbish and removing Himalayan balsam stands, if they could find any. 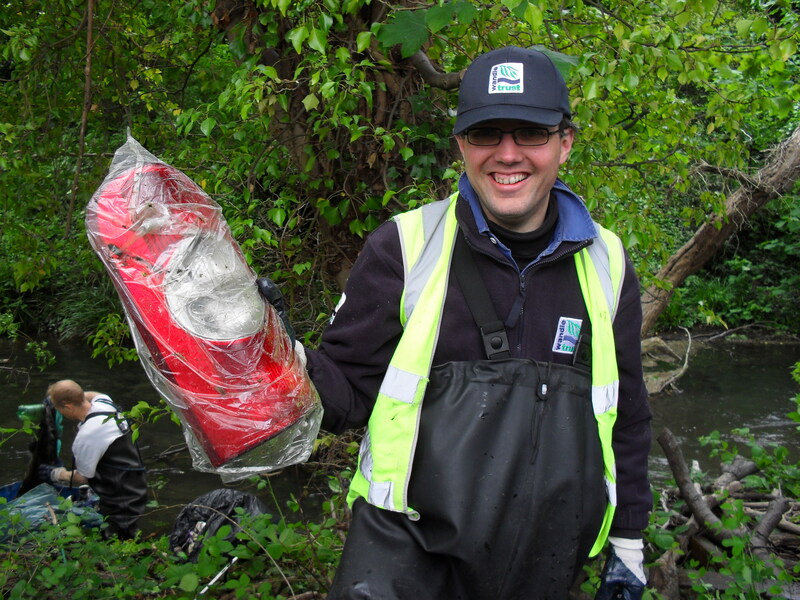 Tim is overseeing some river restoration at this site over the coming months, so a pre-works cleanup was just what was needed. 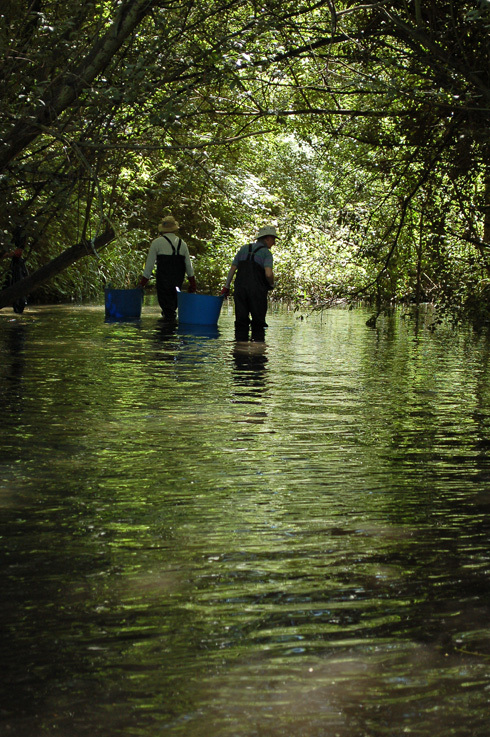 We divided ourselves into two groups to tackle both the left and right hand arms of the river. 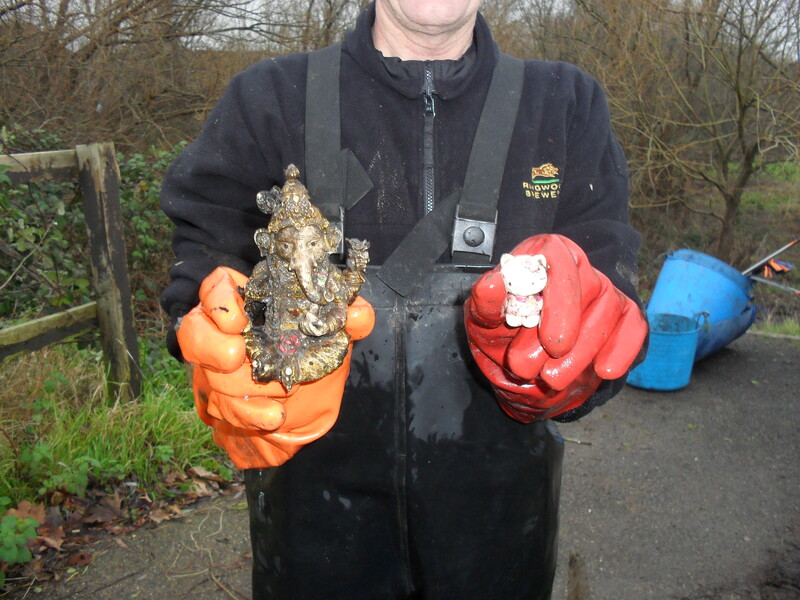 whilst Roger, with a paint tray in one hand, wondered what it was he had just picked up in the other! 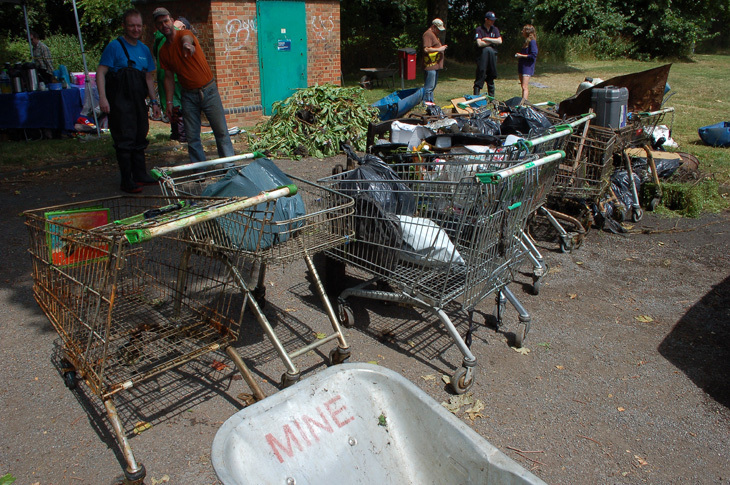 The small party of volunteers who tackled the right hand arm of the Wandle, wheeled back barrow after barrow of light litter, particularly cans of Red Stripe. 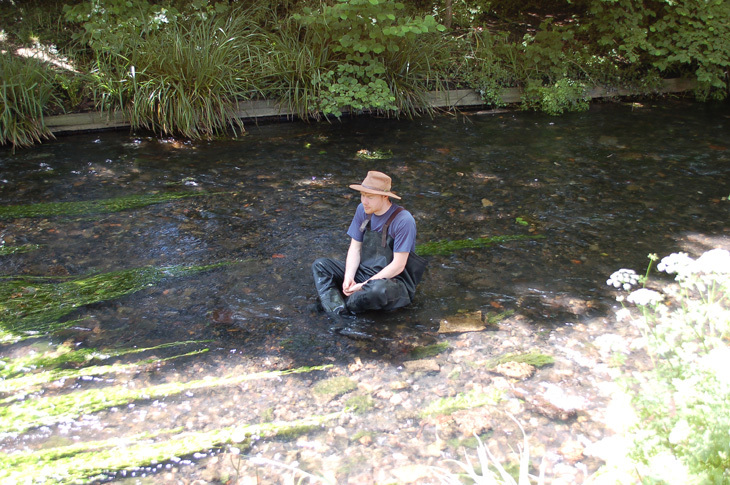 As volunteers waded upstream in the cool shallows of the Wandle searching for rubbish, it was easy to imagine ourselves in the Surrey countryside of bygone days. 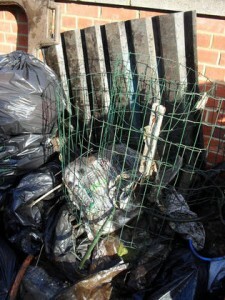 Meanwhile Abi and Jo joined Roger at the growing rubbish pile to unload their trugs. 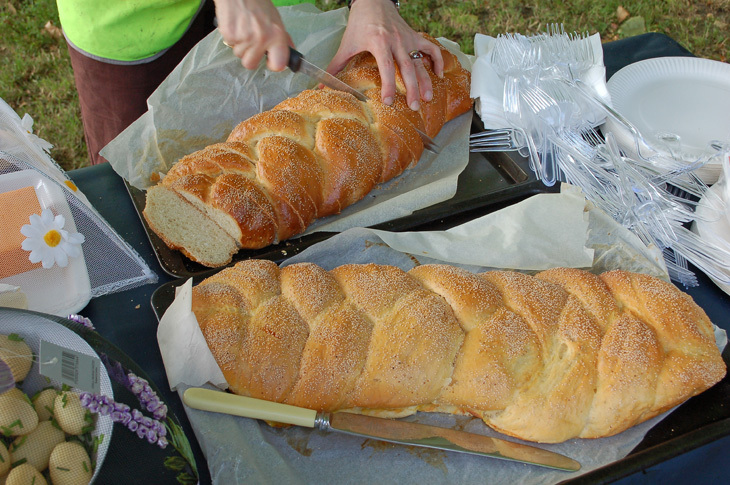 We trooped back to the gazebo to enjoy tea, coffee, squash and delicious cakes brought by Ann, Jana and Sally. There were bananas in one and raspberries in another so we decided we would count a slice of each towards our 5 (or is it 7) a day! Gideon, however, brought his own lunch, a much more healthy option, and settled down for a prandial natter with Tim who decided not to sit on the grass, but relaxed in the Kiwi-painted wheelbarrow that Jo had donated some months earlier. 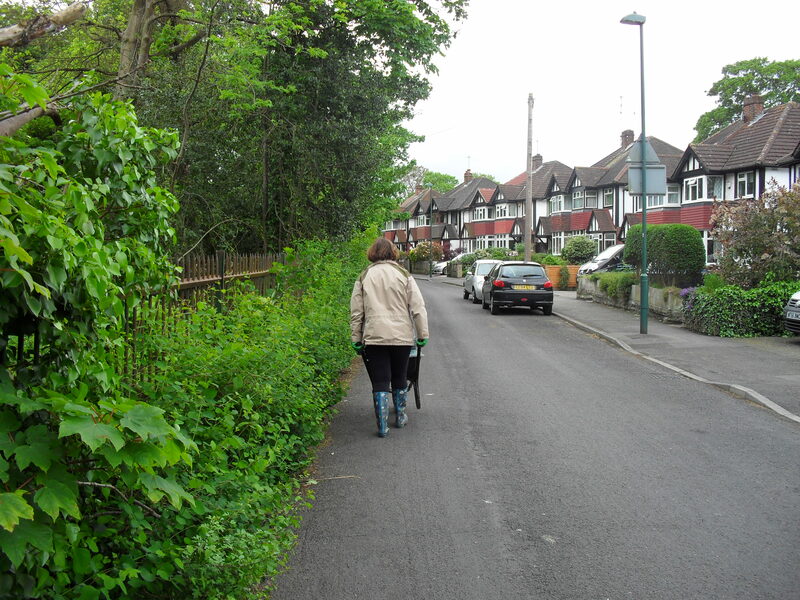 After lunch, when we were refreshed and had topped up our sunscreen, we continued up towards Hackbridge Road. 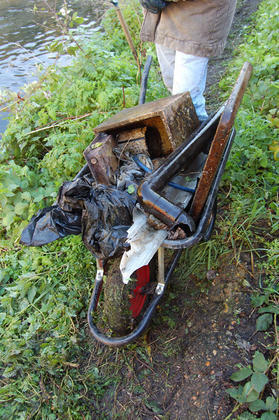 All too soon it was time to down tools, have a final count up of the types and quantity of rubbish removed from the river, load up the van and head on home. 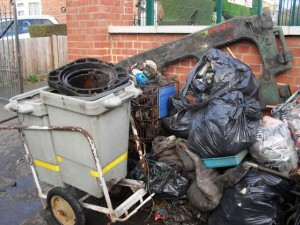 Grateful thanks to David of Sutton’s Waste Management Team for organising collection of all the rubbish. Huge thanks to Gideon and AJ who loaded up the van, and to Gideon again who helped unload the van back at the garage. 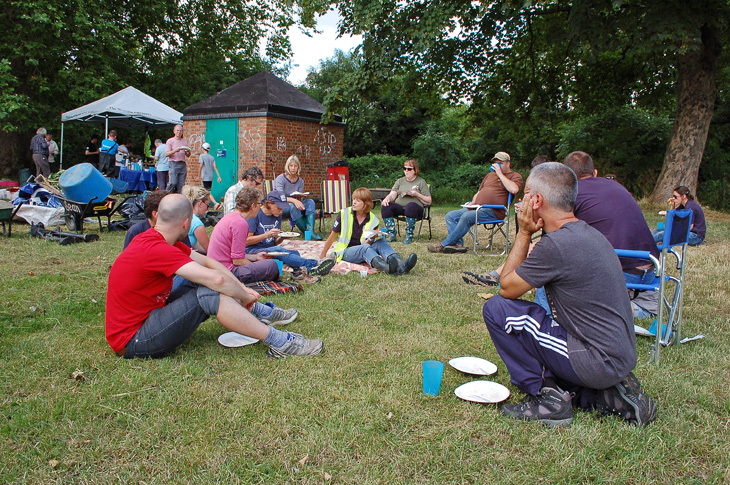 Thanks to all our volunteers: Abi, Adam, AJ, Ann, Bella, Bill, Charles, David, Diana, Eliot, Gearóid, Gideon, Graham, Helen H, Helen O, Jamie, Jana, Jane, John, Jo H, Jo S, Ken, Marianne, Nick B, Nick H, Paul, Roger, Rose, Russell, Sally, Sally Ann, Sid, Theo, Tim, Vera and Will. Who collected: 1 flowerpot, 1 stirrup pump, 1 garden chair, 1 mini snooker table, 1 child’s slide, 1 wheelbarrow, 1 tea light holder, 1 fire extinguisher, 1 carpet sweeper, 1 buggy, 1 radio-controlled boat, 1 suitcase, 1 hanging basket, 1 Jaguar steering wheel, 1 umbrella, 1 window frame, 1 road barrier, 1 child’s bicycle, 1 CD player, 1 car tyre, 1 office chair, 1 ornamental snail, 1 golf ball, 1 iron, 1 laptop, 2 bicycle tyres, 3 children’s scooters, 50 bin bags of light litter, and, of course, there’s always a coconut! 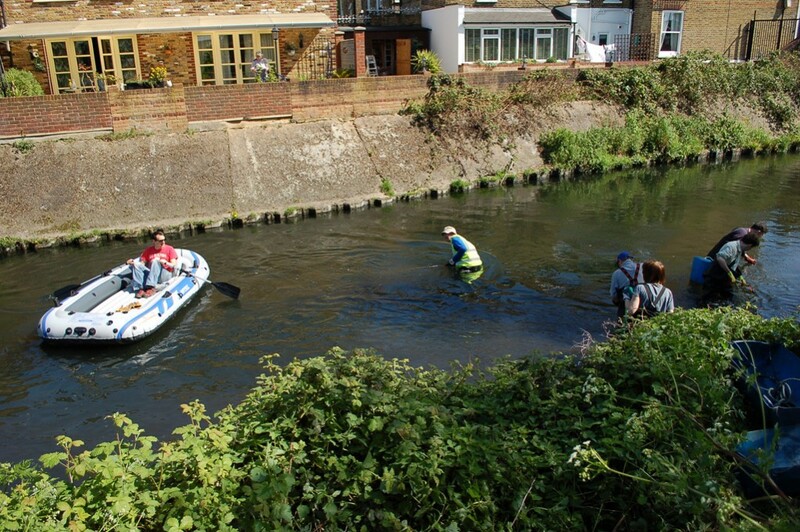 This entry was posted in Uncategorized and tagged Cleanups, Events, Wandle on June 18, 2014 by Erica. 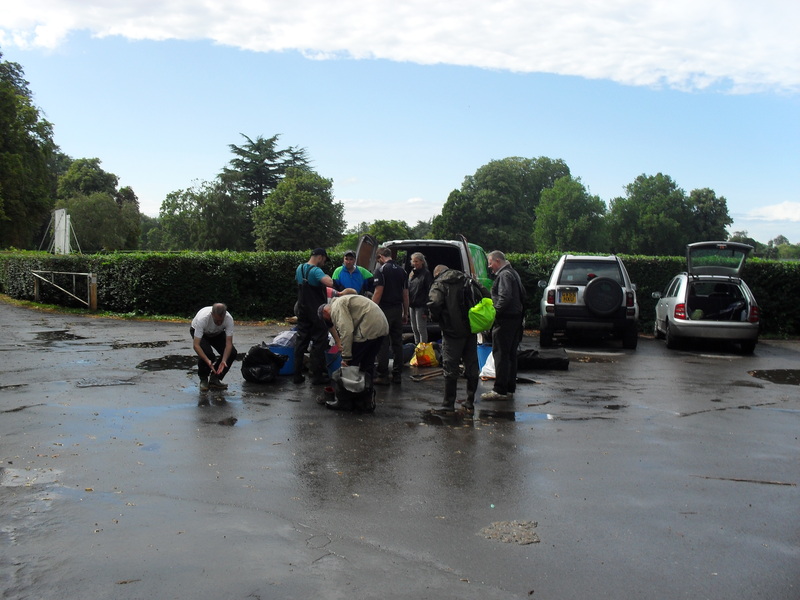 The weather forecast suggested showers on the day of our cleanup in Mill Lane, Carshalton, but even though 31 volunteers came prepared in wet weather gear, barely a drop of rain fell! At the forefront of our minds was the awareness and avoidance of nesting birds. 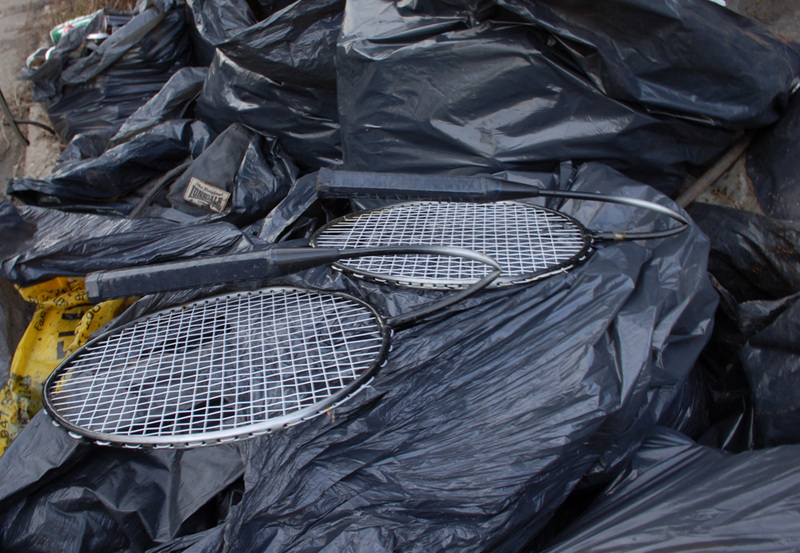 Nesting season is March to August but as only one nest had been spotted, everyone was warned of its location, and we gave the area a wide berth. We decided to tackle the river methodically, with volunteers getting in just downstream from Wilderness Island with a plan to work up to Grove Park, and from the outset an astonishing amount of rubbish was handed over the fence to others waiting expectantly with bin bags and wheelbarrows. 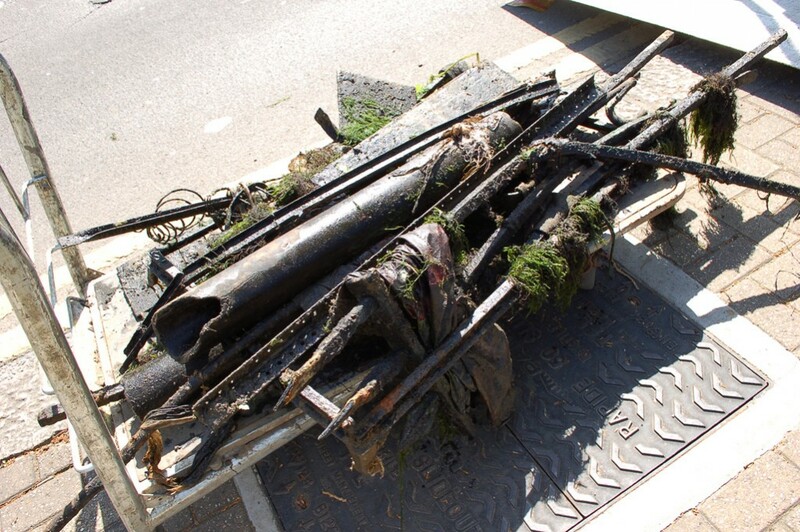 We also agreed that woody debris would remain in the river, but lots of small items had accumulated up against various fallen branches and these required careful extraction. 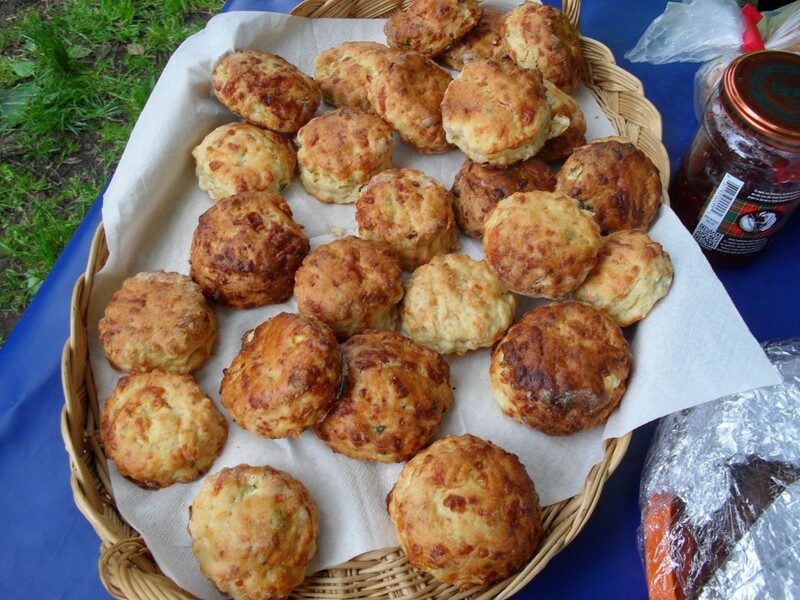 We had reached the railway bridge by lunch time so everyone congregated round the gazebo and enjoyed tea, coffee and cheese scones, rock cakes with optional jam and a dotty chocolate sponge brought by Ann, Jana and Sally. 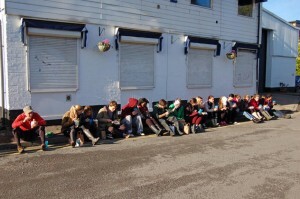 Knowing that we had to get all the way up to the park by 3pm, everyone tucked in and delicious it all was too! 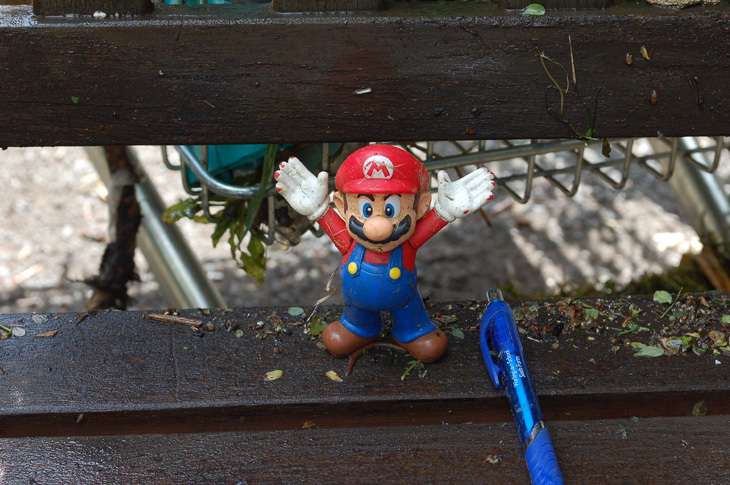 We found a cash box too, but, inevitably, it was empty. 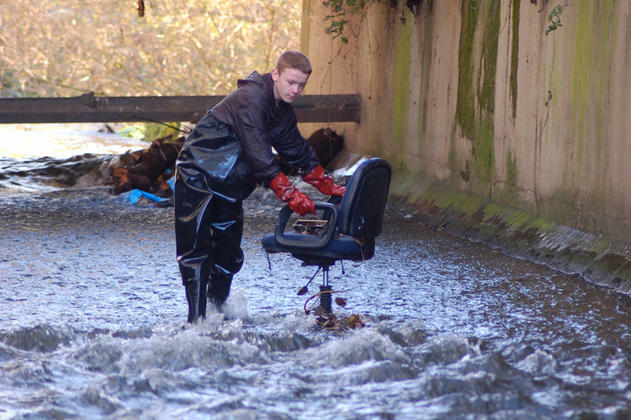 and whether Handel’s ‘water music’ should be played on the keyboard! 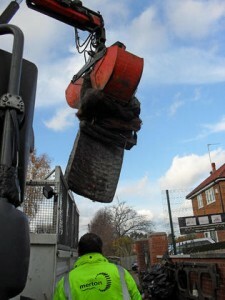 Our thanks to David of Sutton’s Waste Management Team for organising collection of all the rubbish. Huge thanks to Gideon who loaded and unloaded the van, to AJ who loaded up the van, and to John who arrived early to help unload at the site and to keep an eye on volunteers. Thanks to all our volunteers: Ann, Bella, Charles, David, Eliot, Gideon, Gillian, Graham, Ian, Jamie, Jana, Jane, Jason, John B, John L, John N, Joe, Keith, Patrick, Per, Rob, Roger, Rose, Russell, Sally, Sid, Sue, Theo, Tim, Wally and Will. 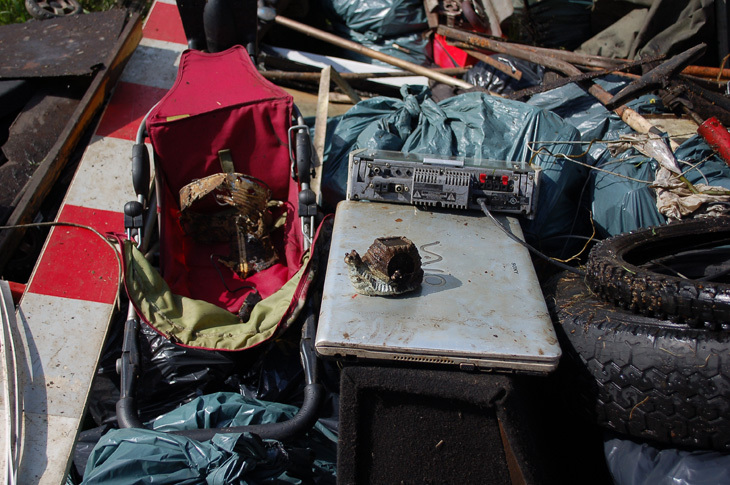 1 carrier bag full of Hindu offerings, 1 hardback book in French, 1 keyboard, 1 tin of paint, 1 curtain pole, 1 fox’s skull, 1 shopping trolley, 1 cash box, 1 flowerpot, 1 ‘sold’ sign, 1 tricycle, 1 satellite dish, 1 car rear light unit, 1 shock absorber, 1 CD, 2 road cones, 2 tyres, 2 chairs, 2 drainpipes, 2 coconuts, 2 parts of a kitchen sink, 2 duvets, 2 bicycles, 3 wooden stakes, 3 concrete fence posts, 3 pieces of chipboard and 19 footballs. We also filled 90 bin bags with bottles, sweet wrappers, empty plastic bags and cans. Wildlife: 1 bullhead in a yoghurt pot which was quickly returned to the river! 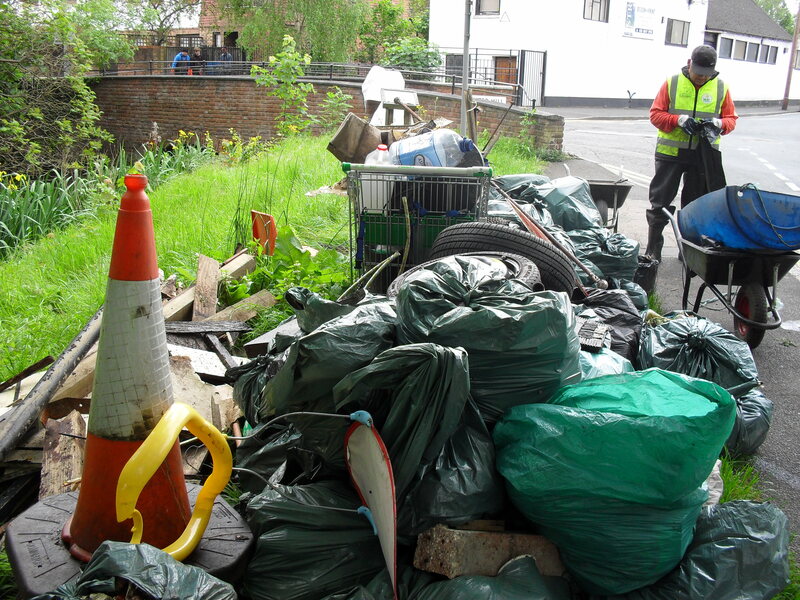 This entry was posted in Uncategorized and tagged Cleanups, Events, Wandle on May 13, 2014 by Erica. 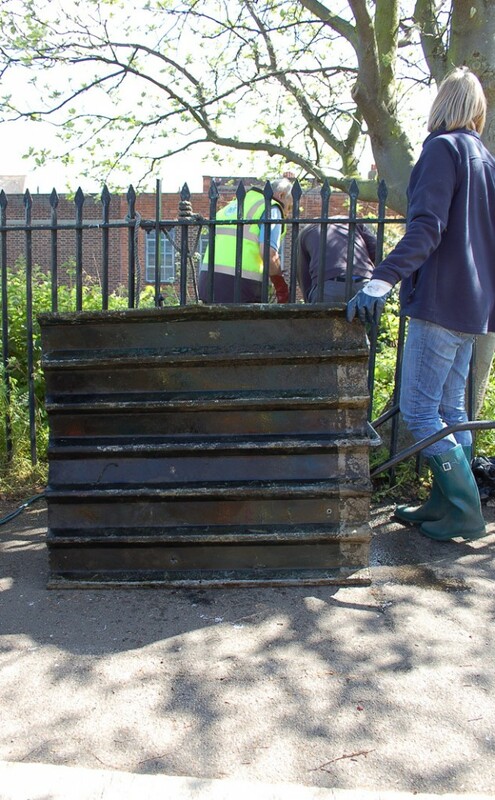 Another glorious Spring day dawned and the sun shone down on 51 volunteers who turned up at King George’s Park in Kimber Road to seek out and remove rubbish that had accumulated below the road bridge and beyond. We were especially delighted to welcome Colin and Adele Brown of local estate agents, Seymour Green, who were kindly supporting this event. 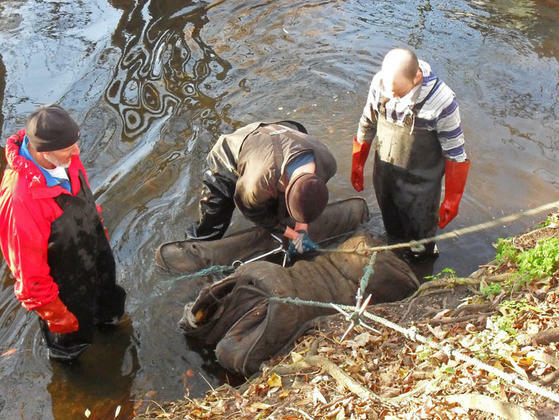 After a couple of months of not being able to get into the river because of high water levels and a pollution spill, about 30 people donned chest waders eager to get into the river below, whilst the remaining twenty or so galvanised themselves for rubbish retrieval. or via an open gate a bit further down, whichever way, we were soon in the river and making our way upstream under the road bridge. and straight into the back of the waiting lorry. 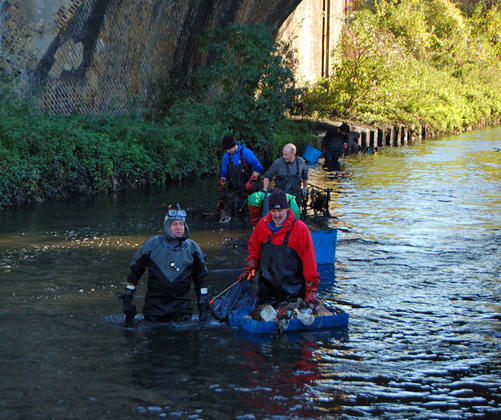 Just before we broke for lunch, we were joined by a photographer from the Wandsworth Guardian who took lots of snaps of us in the river which have now been published online. Ann brought along a delicious banana cake, along with some emergency rations she’d bought from Sainsbury’s, and we munched these with our tea and coffee. 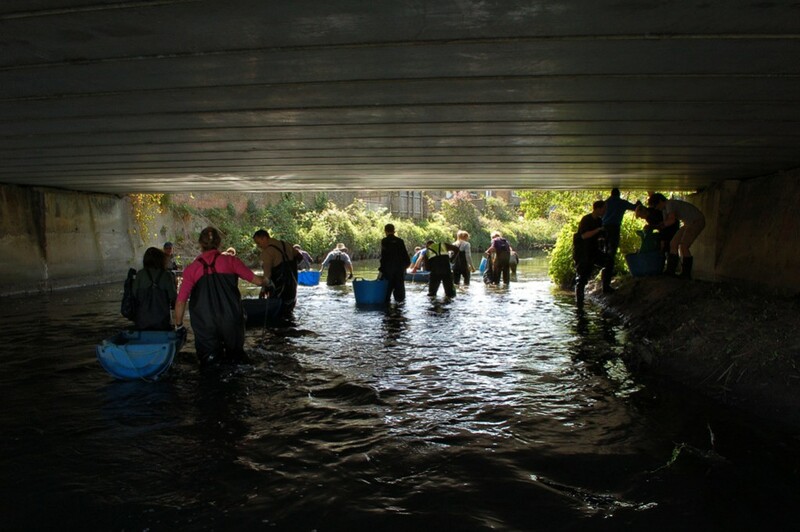 There were fewer people in the group after lunch but that didn’t stop the remainder of us getting back into the water and carrying on the good work. For the first time we were joined by a local resident in an inflatable boat; we weren’t sure who was more surprised, us having to share the river with a boat or him paddling alongside people in waders! 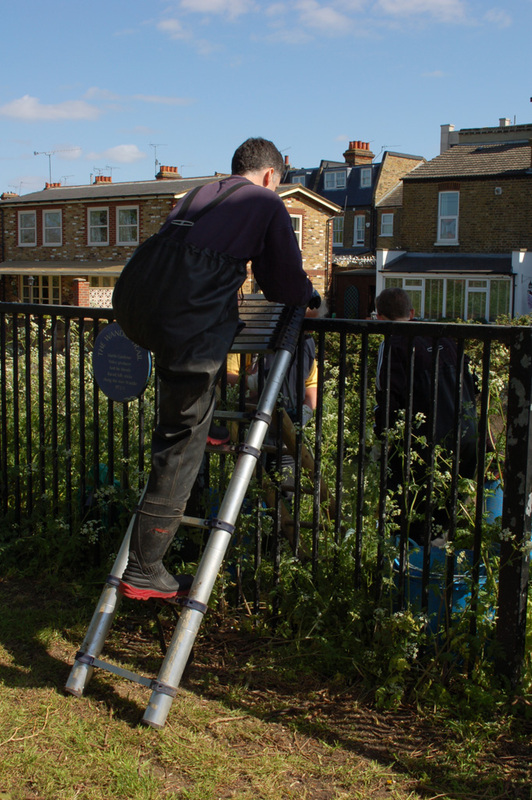 After another friendly chat with a resident whose garden backed on to the water, all too soon it was time to pack up. 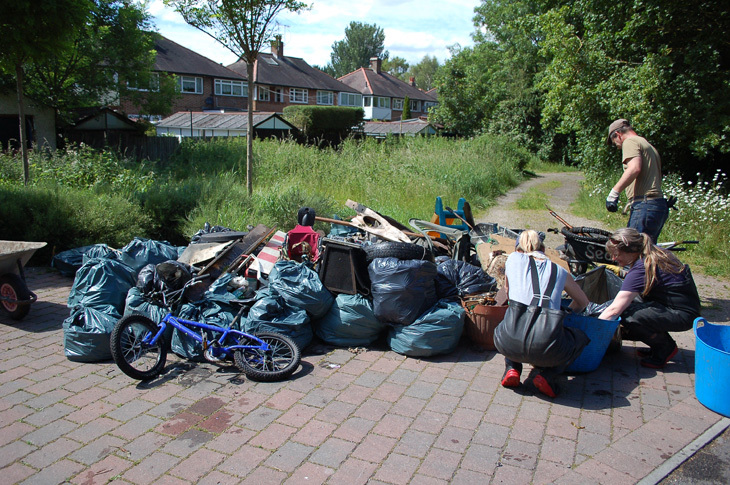 There was less rubbish overall than we had collected in the past, but, we decided, that could only be a good thing. 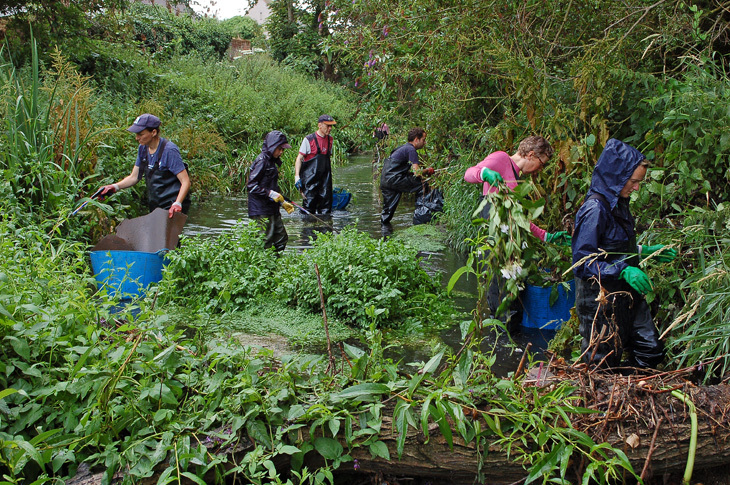 Slowly but surely, our monthly cleanups are achieving their goal – ridding the Wandle of rubbish and making it a better place for residents and wildlife alike. 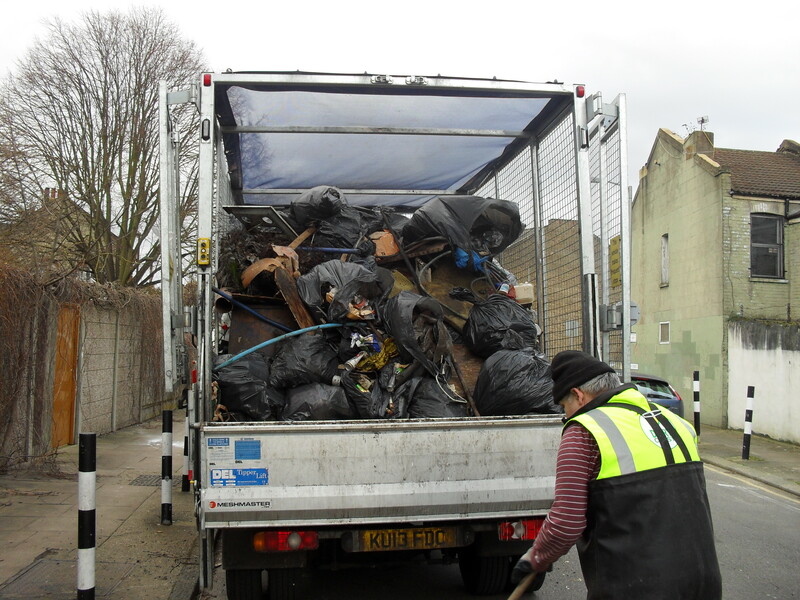 Our grateful thanks go to Joanna and Michael of Wandsworth Waste Management Team for organising collection of all the rubbish and to Terry who turned up with the lorry on the day. 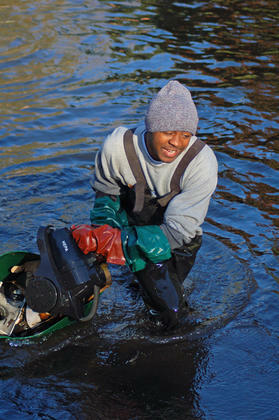 Huge thanks to Gideon who loaded up and unloaded the van and kept a watchful eye on volunteers in the water. 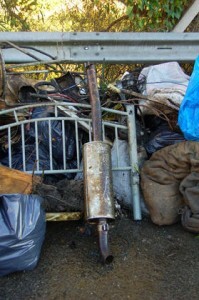 1 wallet, 1 tyre, 1 sheet of corrugated iron, 1 bicycle wheel, 1 drainpipe, 1 fence post, 1 scaffolding pole, 1 plastic bag of shotgun cartridges, 1 rake, 1 length of netting, 1 pane of glass, 1 metal post, 2 pieces of chipboard and up to 50 bags of assorted rubbish including cans, bottles, clothing and plastic bags. 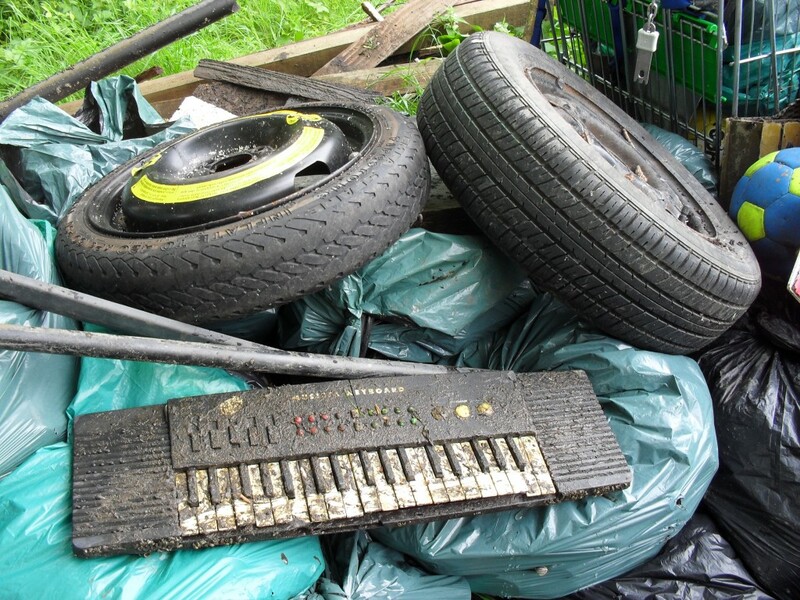 This entry was posted in Uncategorized and tagged Cleanups, Events, Wandle on April 25, 2014 by Erica. 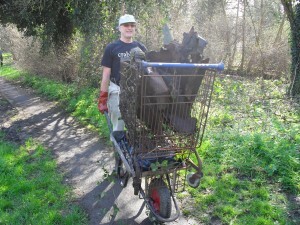 After weeks of rain and grey, soggy days, this month’s cleanup day was wonderfully fine and warm. 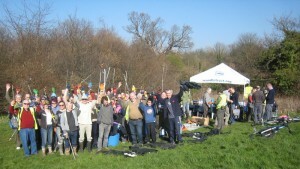 Joining forces with the Wandle Valley Regional Park Trust, the Wandle Valley Forum, the Merton Conservation volunteers, Merton and Sutton Councils, LWT, Willow Lane Business Improvement District, TM United and the EA, we congregated at the edge of the rugby pitches in Poulter Park for a ‘Mega Clean Up Day’. 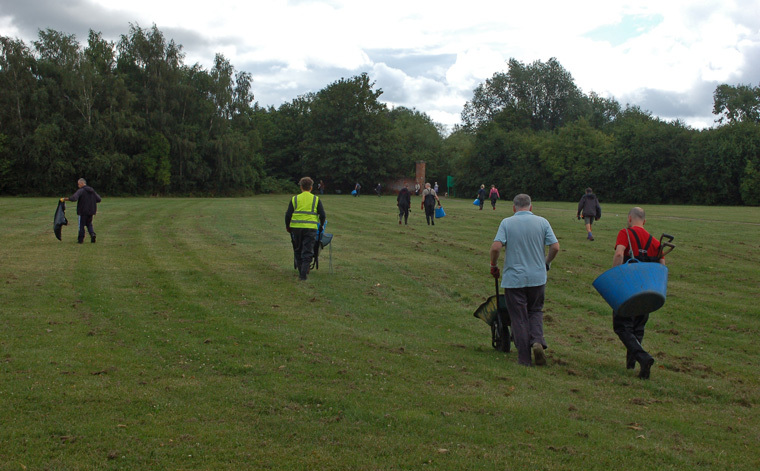 After an few words of introduction and a comprehensive Health and Safety briefing, 65 volunteers equipped themselves with gloves, litter pickers and bin bags and set off to collect as much rubbish as they could in 4 hours. 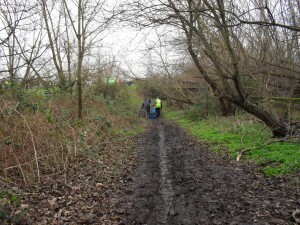 Groups of volunteers, each with a Team Leader, were dispersed to the KNK Stadium, Watermeads, Bennett’s Hole nature reserve, the Wandle Trail, into all the undergrowth and to the edges of the rugby pitches. Again, Wandle Trust volunteers weren’t able to get into the river – but that didn’t stop them safely grappling 4 tyres out of the water to add to the rubbish pile. There was an astonishing variety of rubbish in the undergrowth including two shopping trolleys and a fake leather sofa. 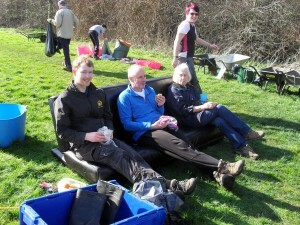 and as we were just about to break for lunch, they set it on the grass where it made a rather luxurious seat for Will, Jamie and Marcia. As well as hot coffee and tea, there were refreshing jugs of squash along with a wonderful selection of cakes – carrot, ginger, chocolate, Dorset apple, blueberry and lemon, cupcakes and flapjacks. 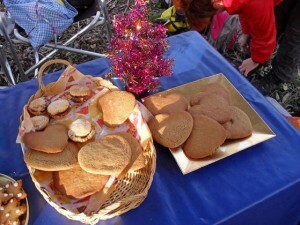 Thanks to Abi, Ann, Jana, Jo and Sally for an excellent edible experience! 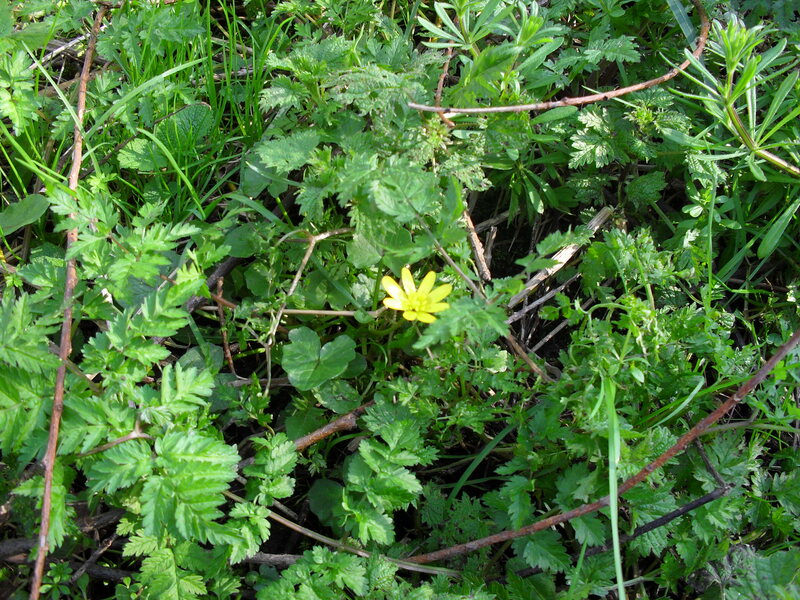 Harnessing this collective sugar rush, we went back to the task in hand, noticing that patches of Celandine were springing up along the pathway. Thanks to AJ and Gideon who loaded up and unloaded the van. 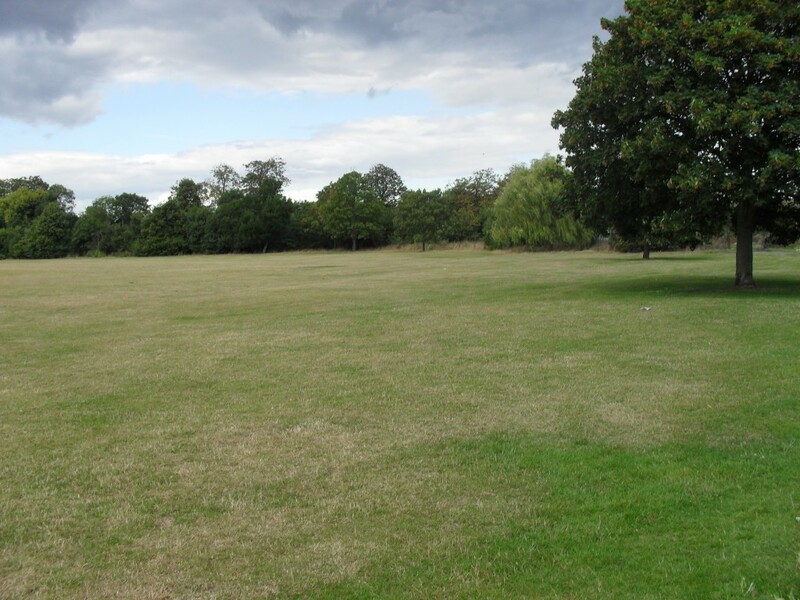 Thanks to Peter Hegarty for use of the facilities at the Mitcham Rugby Club. Huge thanks to Tony of Merton Waste Management Team, who sent Stan on the day, and to David of Sutton Waste Management Team for organising collection of all the rubbish. 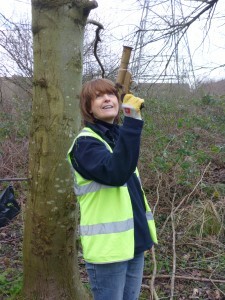 Thanks to all our volunteers: AJ, Abi, Alan G, Alan W, Andy B, Andy W, Angela G, Angela N, Ann, Barry, Bella, Bill, Bruce, Charles, Davinia, Denis, Dominic, Eliot, Erica, Gareth, Gearóid, Gideon, Ian, Jamie, Jan, Jo, Joe, John B, John L, John N, Kate, Keith, Laurent, Lisa, Lyn, Marcia, Mark Mc, Mark P, Melanie, Michael, Mike, Nigel, Oscar, Patricia, Per, Peter C, Peter W, Phoebe, Rebecca, Rob, Roger, Rose, Sally, Sophie, Stephen, Sue B, Sue M, Suzanne, Theo, Tim H, Tim L, Tina, Toby, Wally and Will. ½ a coconut, ½ a jar of peanut butter, ½ a mattress, 1 section of metal fence, 1 sofa cushion, 1 pair of socks, 1 adjustable legs of office chair, 1 pallett, 1 fire extinguisher, 1 iron, 1 air conditioning unit, 1 compost bin, 1 scaffolding pole, 1 car bumper, 1 chainlink fence, 1 plastic sledge, 1 estate agent’s sign, 1 motorbike bumper, 1 parcel shelf, 1 plastic Christmas tree, 1 duvet, 1 mop, 1 plastic barrier, 1 fake leather sofa, 1 arrow, 1 road cone, 1 golf umbrella, 1 motorcycle frame, 2 gas canisters, 2 shopping trolleys, 2 plastic pipes, 3 fridge freezers, 4 tyres and 74 bin bags of rubbish. This entry was posted in Uncategorized and tagged Cleanups, Events, Wandle on March 19, 2014 by Erica. February’s cleanup day dawned fine, although there was a keen wind, and the weather pretty much stayed that way for most of the day. 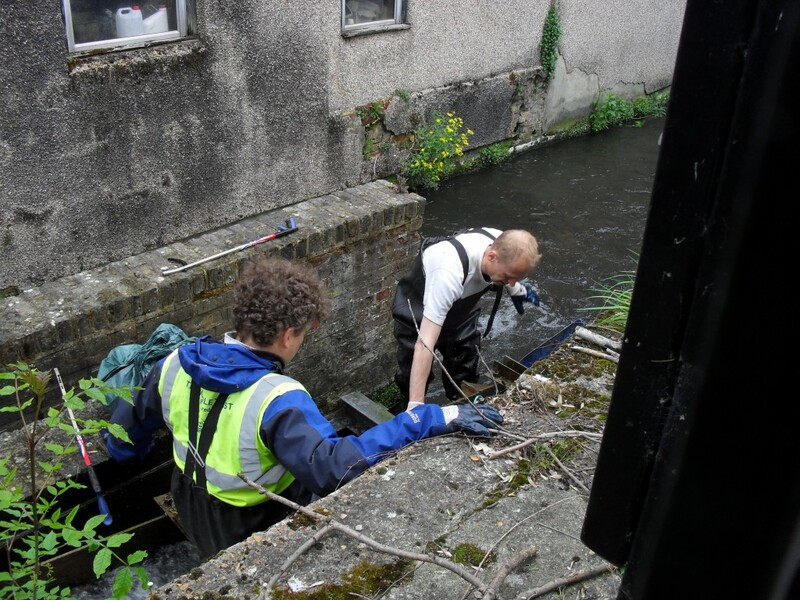 Even though they’d received the news that they would not be able to get into the river because of high water levels, 34 volunteers turned up at Trewint Street to help clear the banks and Trail of litter. 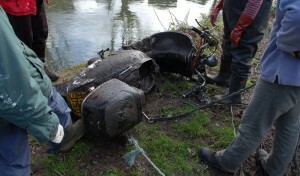 Straightaway, eagle-eyed volunteers spotted the brake handle of what looked like a motorbike in the river. It had tantalisingly broken the surface of the water just by the metal gates, and, unable to resist a challenge, some of the guys managed to get our ropes tied round the handlebars from the bank and, a couple of heaves later, a newish motor scooter was out and ready to be pushed to the dumpsite. 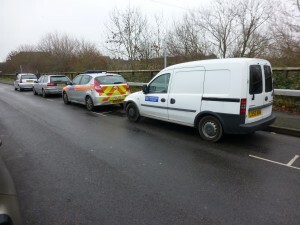 Having spotted that the tax disc was still in date and the number plate intact, another call to the non-emergency 101 number was made, and two police officers turned up to investigate. 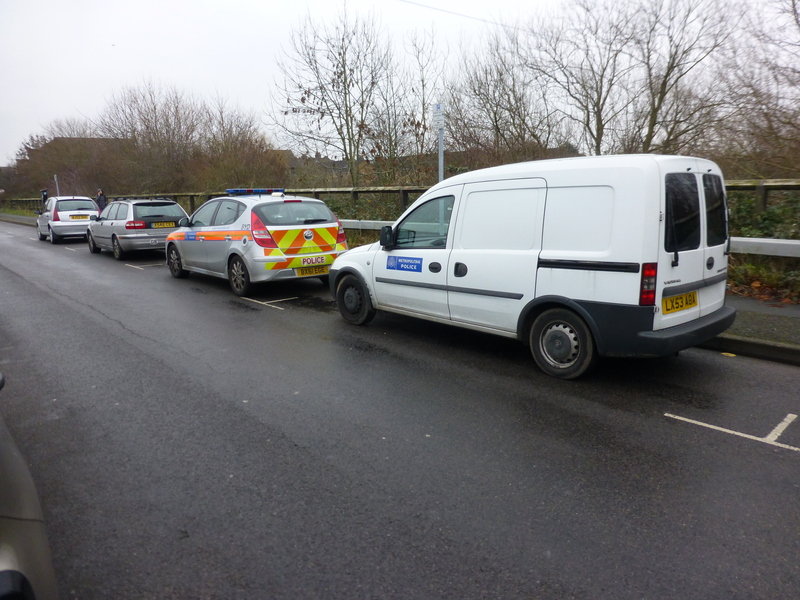 They called the owner, who confirmed that he had reported it stolen and that, as he lived locally, he would pop along later to take a look at his former mode of transport. 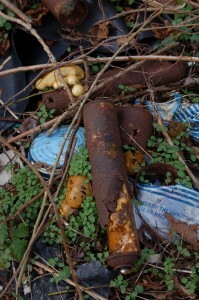 and to collect dozens of empty beer cans discarded along the cut through to Weir Road from the Trail. Carol discovered that if she pulled her wheelbarrow along behind her the wheel squeaked less than when she pushed it! 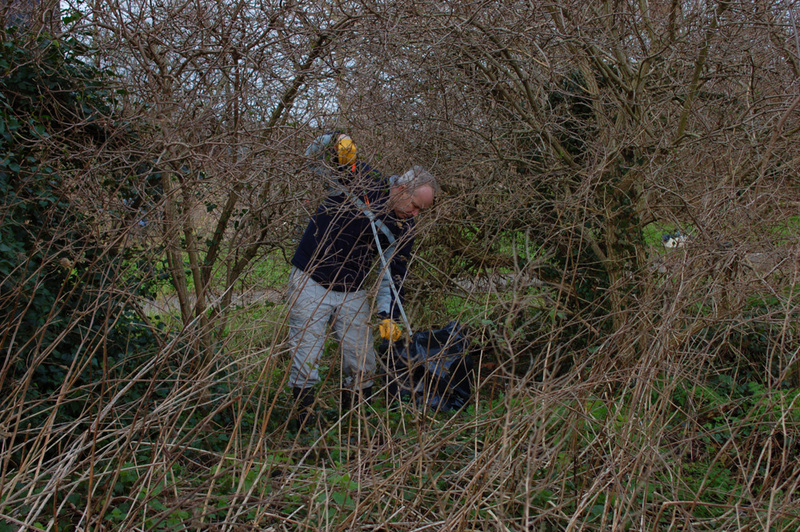 Deep in the undergrowth the long handled litter pickers came in very handy as volunteers could easily get at rubbish tangled in its thorny tendrils. We stopped for a welcome break at about 1pm and enjoyed cheese scones and chocolate marble cake brought by Ann and Jana. Sally dispensed cups of hot tea and coffee which helped warm us up from the inside out. After lunch, we walked towards Plough Lane picking up rubbish on both sides of the soon-to-be widened Trail. 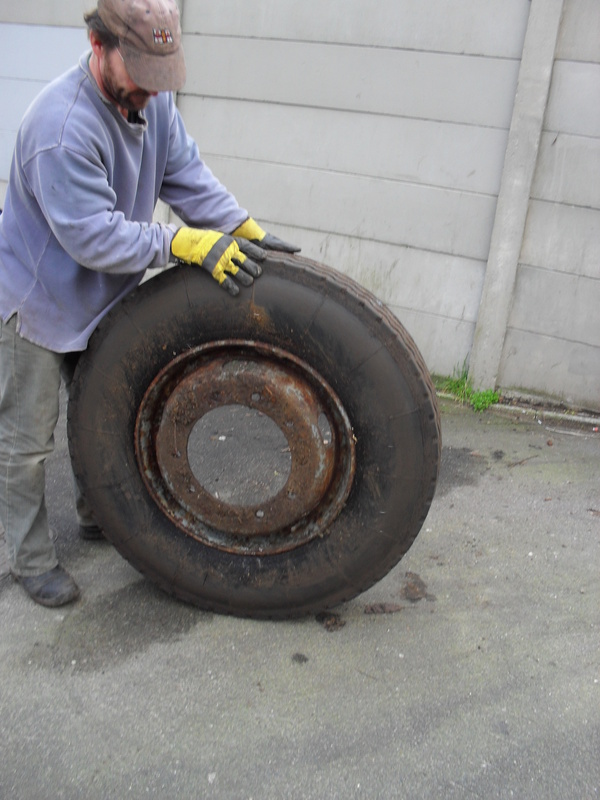 Time flew by and as we wheeled our barrows full of rubbish back to the dumpsite for one last time, we came across Eliot and Leonie, amongst others, who had found a lorry wheel embedded in the grass verge and had, at that stage, managed to dig half of it out. 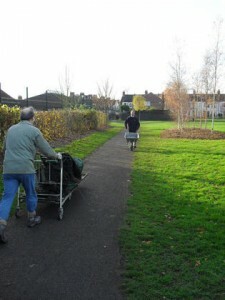 Very soon afterwards, they had dragged it free of its earthy resting place and Roger rolled it expertly along the concrete to stack it along with others. Thanks to Terry who turned up in a cage lorry nice and early so that we could begin to load up the rubbish collected thus far, and to Joanna and Michael at Wandsworth’s waste management department who organised the collection. Everyone helped load up the lorry and we were amazed to discover that we filled it to the top. 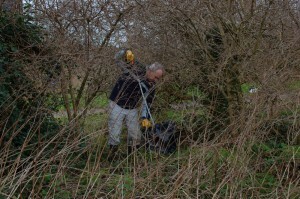 Wally diligently swept the pavement where the rubbish had been stacked, leaving it nice and tidy. Huge thanks to Gideon and AJ to helped load up the van and to Gideon who helped unload it. 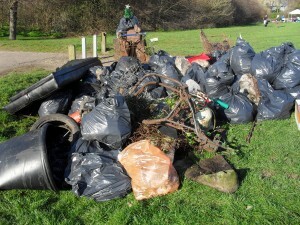 Who removed: 1 lorry wheel, 1 bike lock, 1 motor scooter, 1 chair, 1 radiator, 1 dustbin, 1 plastic bucket, 1 washing up bowl, 1 football, 1 bicycle wheel, 1 vacuum cleaner hose, 1 electric fire, 1 gas cylinder, 1 child’s bicycle, 1 kitchen sink, 1 oil drum, 1 eel net, 1 road cone, 1 cooker hob, 1 skateboard, 1 child’s scooter, 1 boiler cover, 1 mattress, 2 squash rackets, 2 water carriers, 2 DVDs, 4 carpets, 4 car tyres and at least 60 bin bags full of assorted types of rubbish. This entry was posted in Uncategorized and tagged Cleanups, Events, Wandle on February 19, 2014 by Erica. 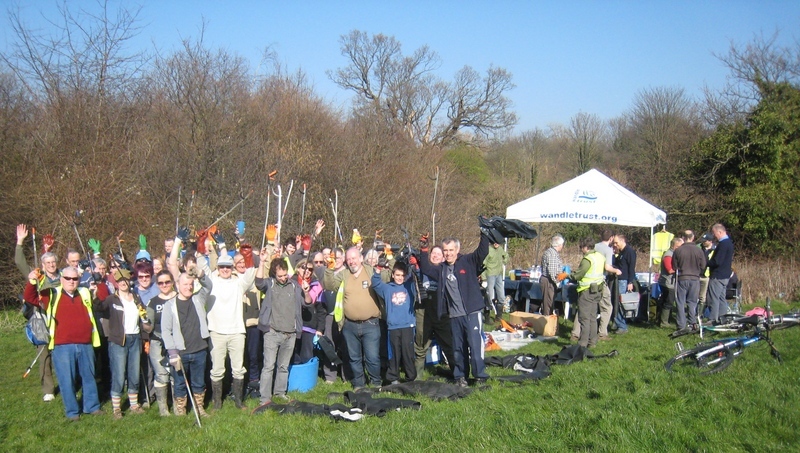 On a bright, astonishingly rain-free morning, 37 volunteers gathered at a rather muddy Wandle Meadow to tackle the next 50m upstream of where we had cleaned up just before Christmas. 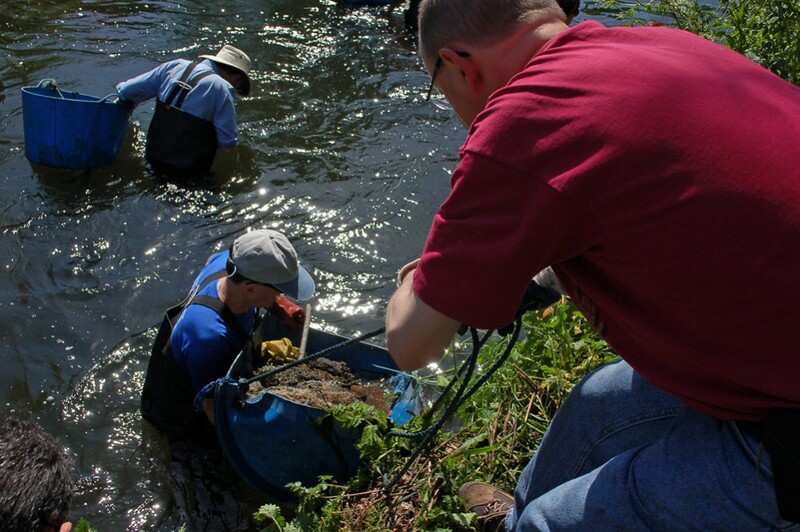 Following weeks of inclement weather, there had been some doubt as to whether our volunteers would be able to get into the river at all as the water level was up and the current stronger. 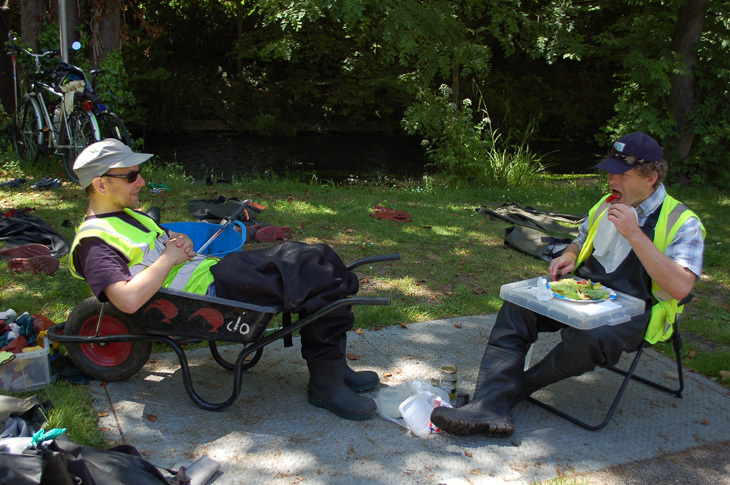 However, whilst we were unloading the van, Gideon and Theo, already in waders, decided to recce the site and wade the river again, and, on their return to the gazebo, deemed it safe for volunteers to get in, although we reiterated the risks during our regular health and safety briefing, telling them to take extra care. 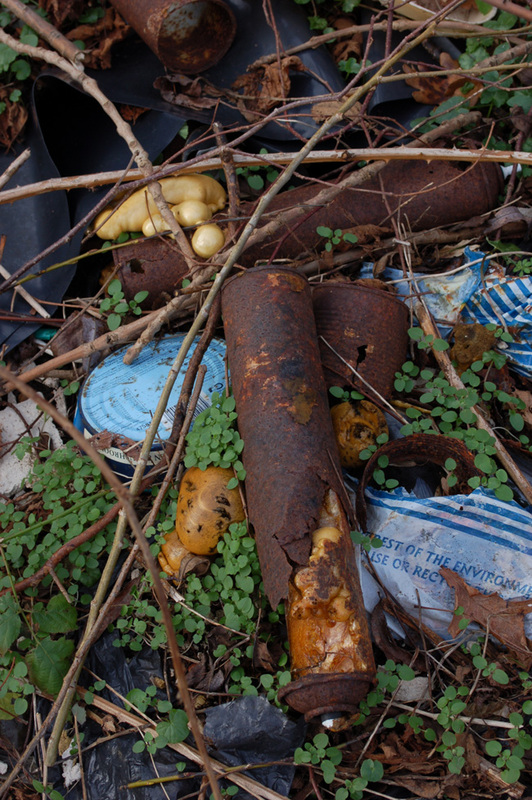 Fairly early on, whilst picking up litter in the undergrowth, Phil found what he thought looked like a sawn-off shotgun wrapped in two plastic bags. 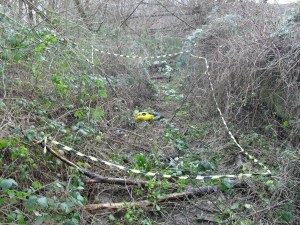 Having cordoned off the area with black and yellow tape, we made a call via the new non-emergency 101 number to the Metropolitan police, and within twenty minutes, 2 police officers arrived. 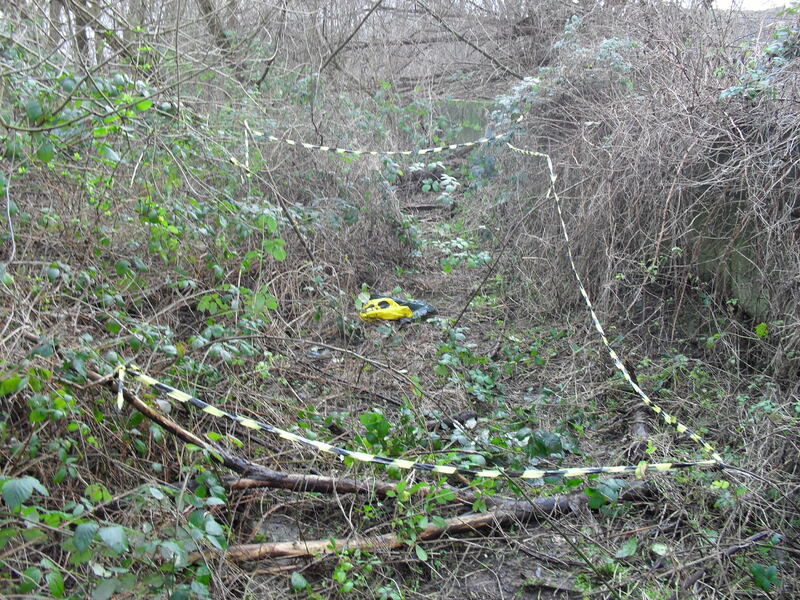 On closer inspection they decided that they would call the firearms and ballistics department and then remained with the evidence to await their colleague. 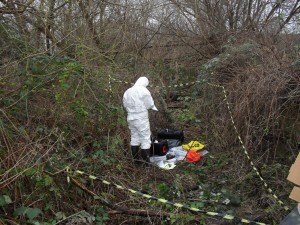 The ballistics officer was well-prepared, dressed in a coverall and Wellington boots and brought all the equipment she needed to transport the firearm offsite safely. 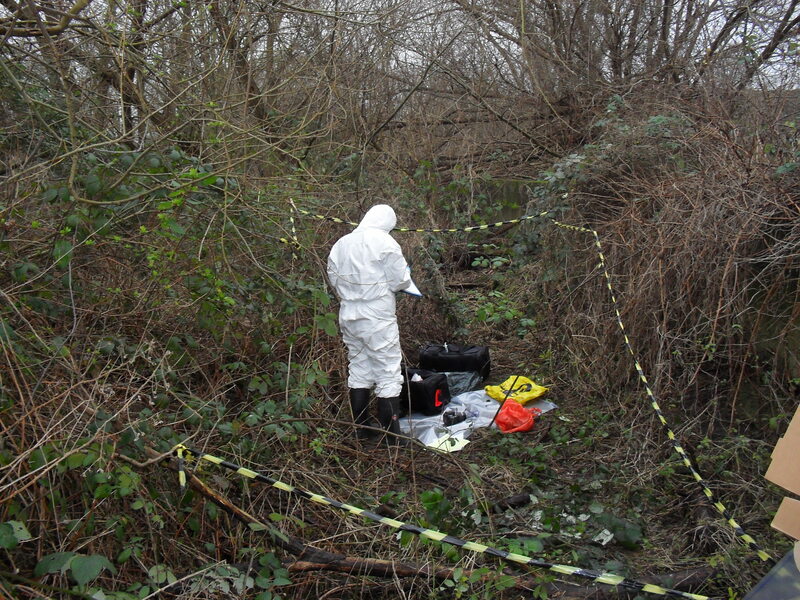 Apparently, when she opened the plastic bags, there was a handgun alongside the shotgun which is why all three officers remained on the bank until nearly 3pm! 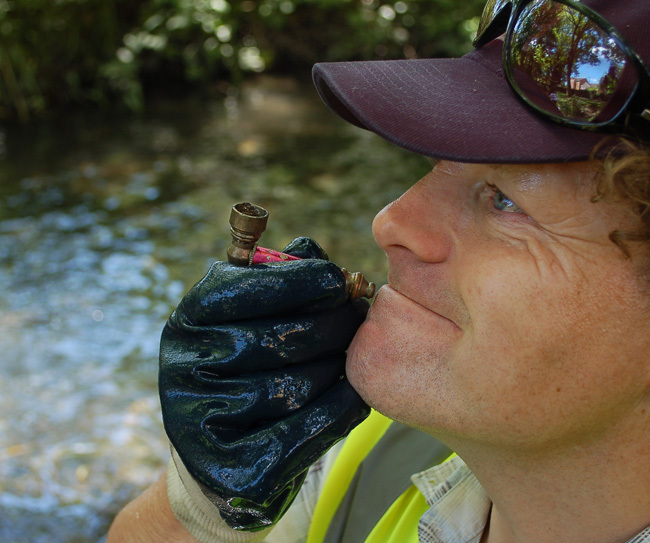 Not long afterwards, Phil found a Webley & Scott flare pistol which Mike pointed out was brass and may have dated from WW1! 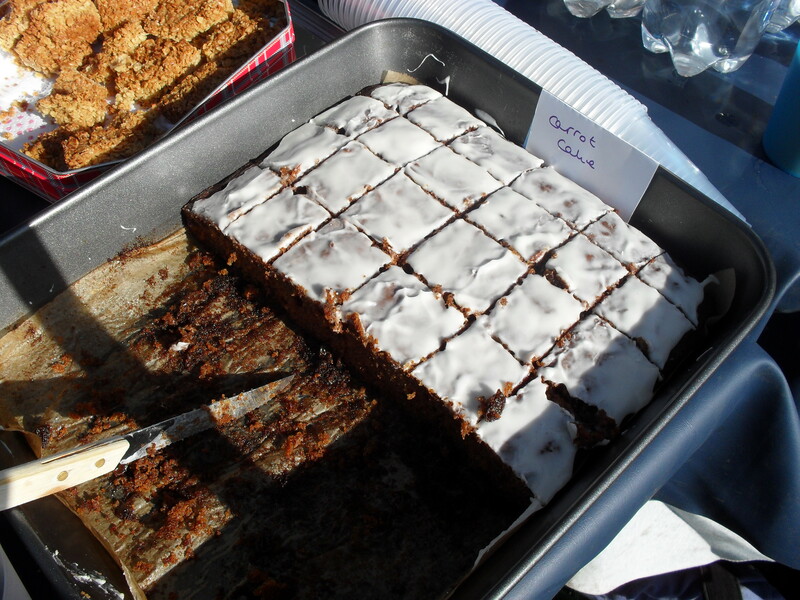 So much excitement certainly gave us an appetite and very soon we stopped for delicious carrot cake and banana bread baked by Jana and Jane, served up with cups of steaming hot coffee and tea by Sally. Back to work after our break, more usual items were retrieved from the river and the pile began to build on the North Road bridge. 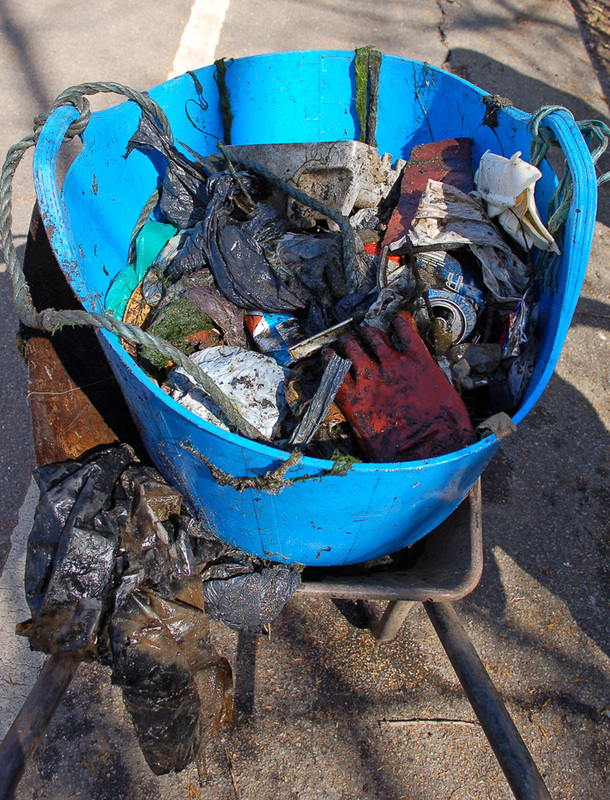 Various passers-by stopped and looked in disbelief at the collection of rubbish, asking whether it had all come out of the water which, we confirmed, it had. Mark posed with two very diverse cultural icons he’d found – Ganesha and Hello Kitty! 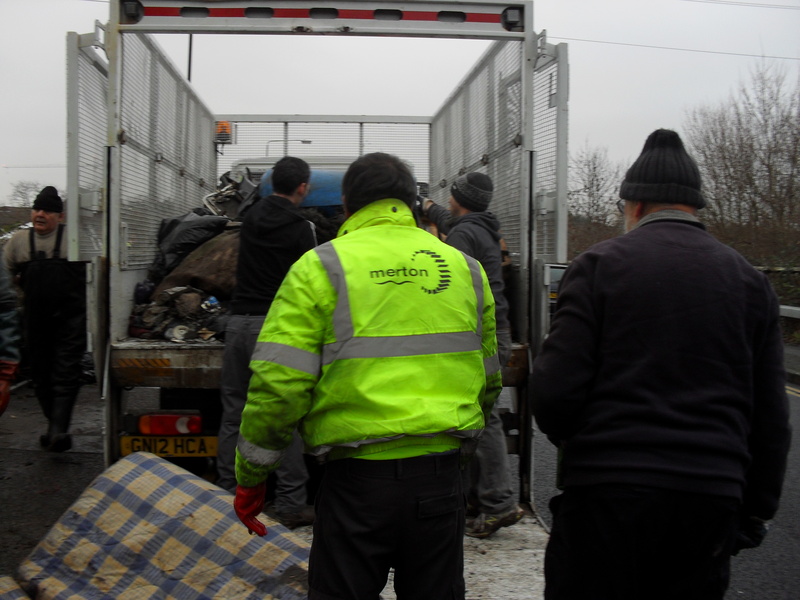 Thanks to Stan who turned up with a cage lorry nice and promptly at 2pm as the skies had started to darken and the temperature to drop, and to Tony at Merton’s waste management division who organised the collection. Huge thanks to Gideon and AJ who helped load up and unload the van. Thanks to our volunteers: AJ, Annic, Brian, Carol, Charles, Chris, Eliott, Francesca, Gearoid, Gideon, James, Jamie, Jana, Jane, Jill, John, Kelly, Ken, Leo, Leonie, Lizzie, Lucy, Mark, Nick, Patrick B, Patrick H, Phil, Rachel, Rob, Rose, Sally, Theo, Tim, Will, Wally… and not forgetting Josie the spaniel! Who removed: 1 sawn off shotgun, 1 handgun, 1 flare pistol, 1 coconut (always! 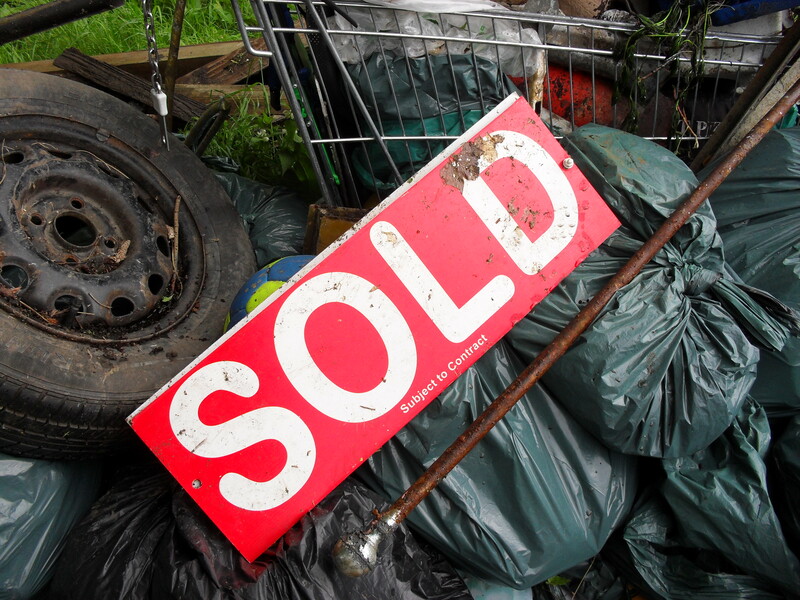 ), 1 horseshoe, 1 statue of Buddha, 1 signpost, 1 toy car, 1 shower tray , 1 mattress, 1 child’s buggy , 1 bicycle wheel, 1 garden gate, 1 car battery, 1 road light, 2 shopping trolleys, 2 road cones, 2 wire rolls, 3 carpets, 3 window boxes, 2 bicycle tyres, 6 car tyres and at least 40 bin bags of assorted litter. 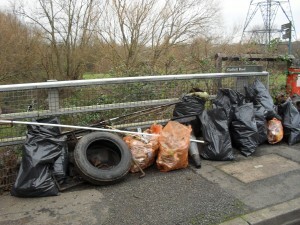 This entry was posted in Uncategorized and tagged Cleanups, Events, Wandle on January 21, 2014 by Erica. 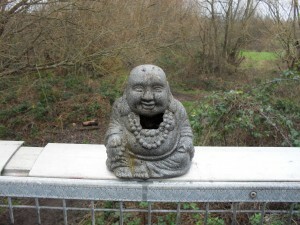 The one with a load of old doggerel! 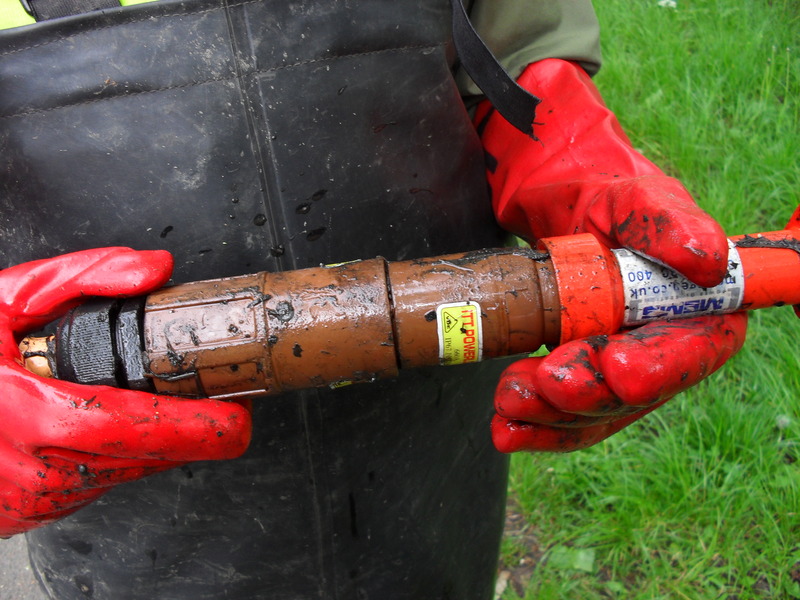 Was so waterlogged, we agreed that it stank! 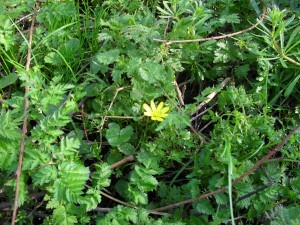 What might we find later? A safe, or a fridge? A tiny Saint Nicholas loomed; Ho, ho, ho! 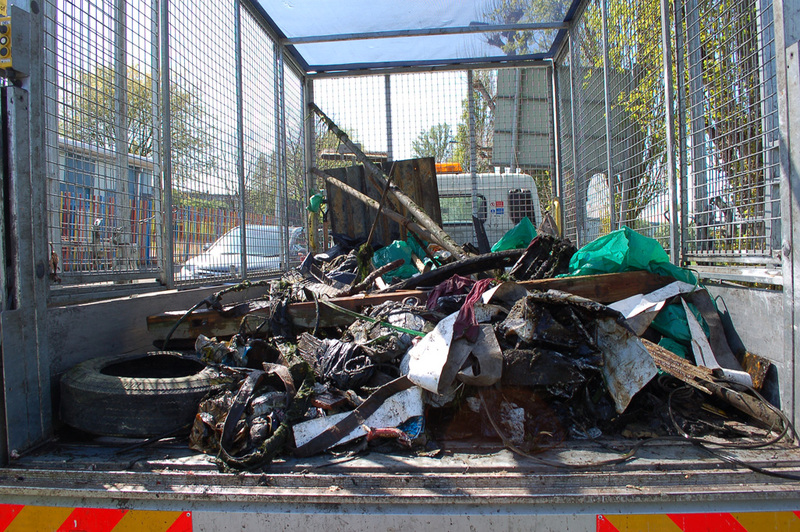 Our thanks to Tony from Merton’s waste management team who arranged collection of all the rubbish and to Stan who loaded it all onto the truck. Thanks to AJ who helped load up the van and to both AJ and Gideon who helped unload it afterwards. 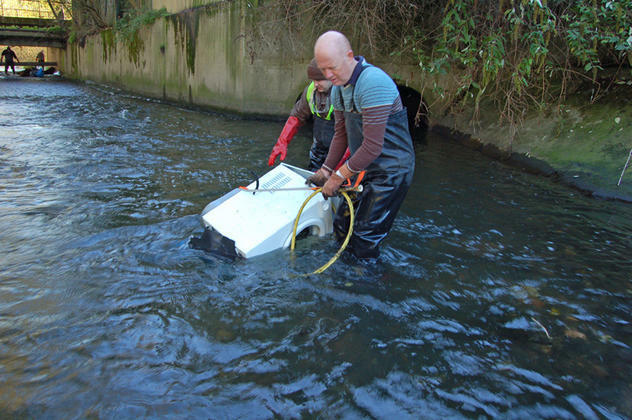 Thanks to Simon, one of our Trustees, who helped put together our new gas boiler and test it. 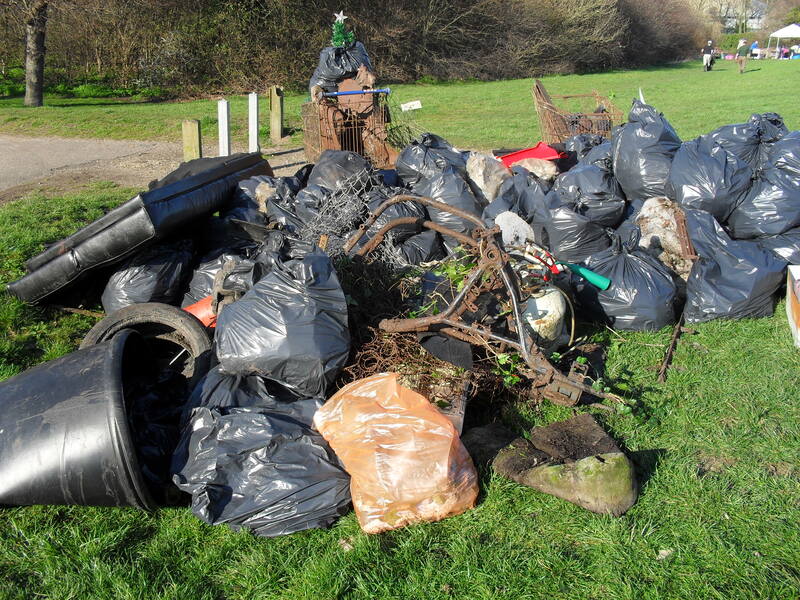 Who removed: 1 roll of green wire, 1 broom, 1 rake, 1 scaffold pole, 1 chain link fence, 1 bicycle wheel, 1 garden chair, 1 street sweeper’s trolley, 1 shop sign, 1 statue of Ganesh, 1 Hindu picture, 1 hub cap, 1 tennis racket, 1 umbrella, 1 tin bowl, 1 shovel, 2 railway insulator pots, 2 road barriers, 2 bicycle frames, 2 shopping trolleys, 3 bicycle tyres, 3 footballs, 3 televisions, 4 mattresses, 4 carpets, 4 pieces of MDF, 7 road cones, 12 car tyres and at least 30 bin bags of assorted rubbish. 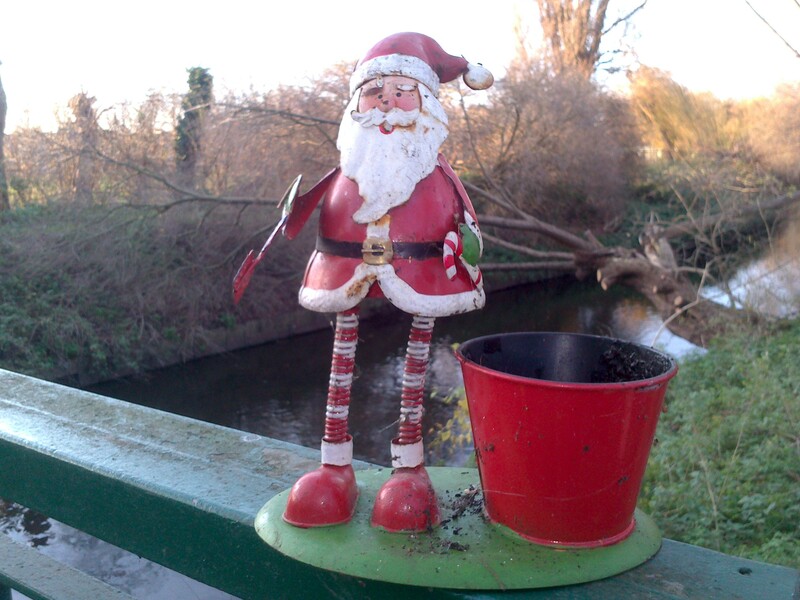 This entry was posted in Uncategorized and tagged Cleanups, Events, Wandle on December 15, 2013 by Erica. It was like déjà vu all over again! 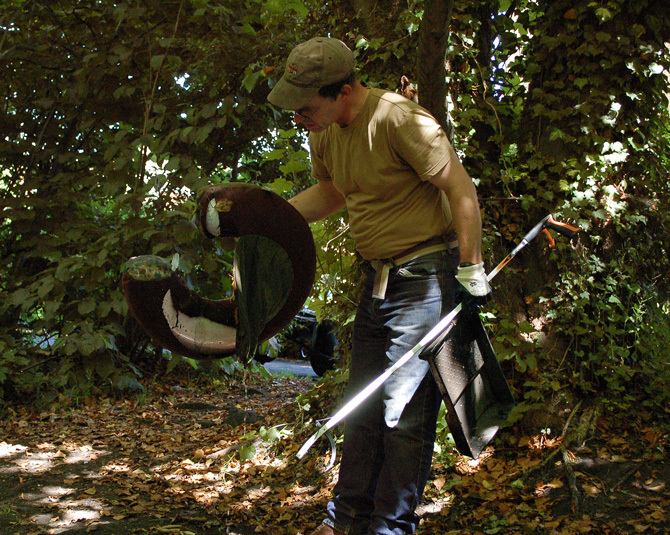 Here we were at Ravensbury Terrace – again – with a van load of kit – again – but this time a bright Autumn sun shone down on a tranquil river, the torrential rain and murky spate of last month’s cleanup a distant memory. 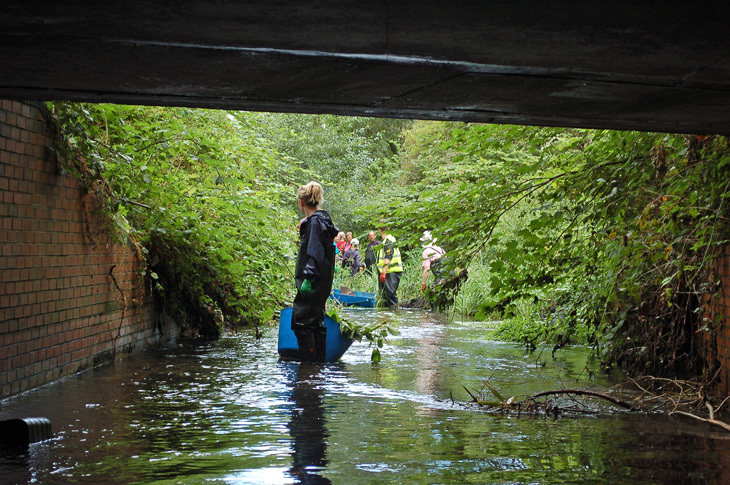 Eager to help, a record 73 volunteers turned up to tackle 100m of the Wandle up and downstream of the Haslemere Industrial Estate. 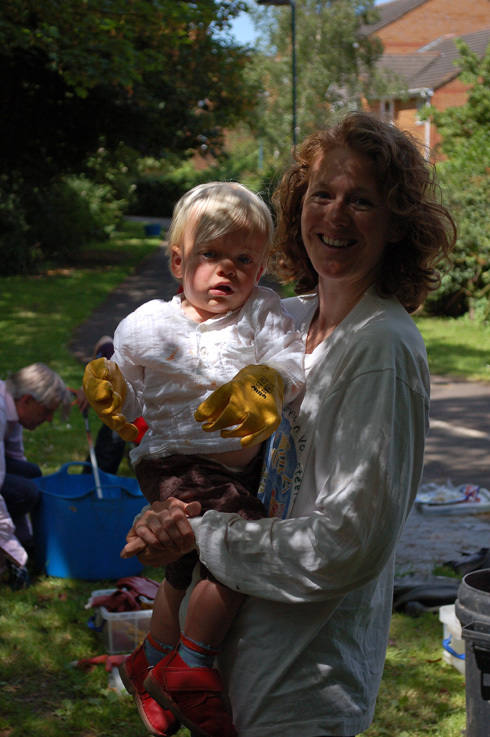 We were particularly delighted to welcome Colin and Adele Brown of local estate agents, Seymour Green, who were kindly supporting this month’s cleanup. 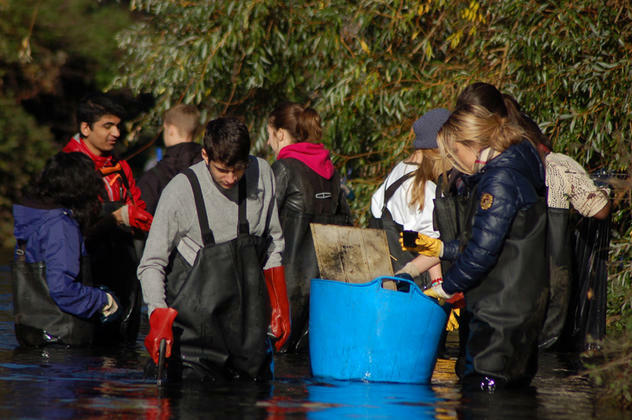 About 40 students from the American International University – Richmond Hill Campus – joined our regular volunteers too, and even though they were novices, this didn’t dampen their enthusiasm for or their enjoyment of the event. 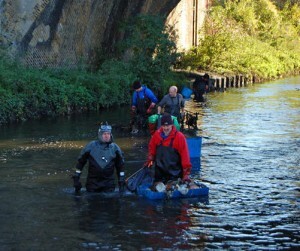 With some of the volunteers in the river, others assembled along the bank, ready to retrieve the rubbish as it came out of the river, filling up wheelbarrows and negotiating the rather narrow pathway back to the dumpsite. Joining us in the water part way through the morning was our old friend Gordon the diver. This made searching for and removing submerged objects much easier, because he, at least, could see what he was doing! 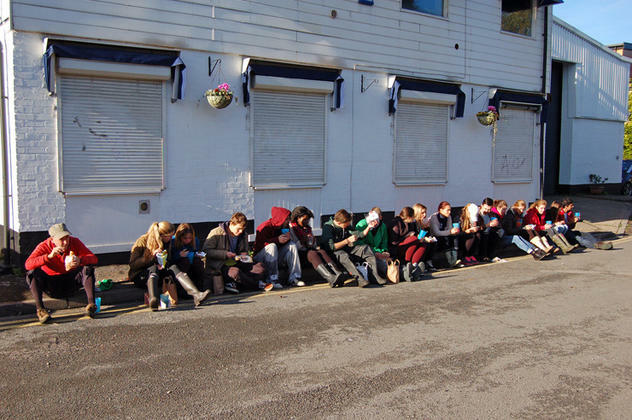 At one o’clock we were more than ready for a break. 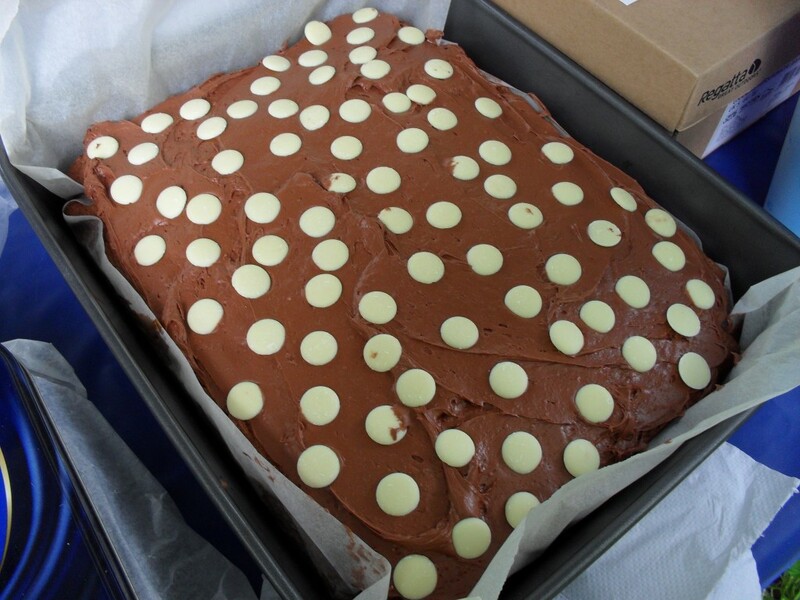 Following a baking bonanza, Sally brought ginger cake, Jana used beetroot from her allotment and combined it with chocolate to make a sponge, and Robert produced a beautifully iced carrot cake. 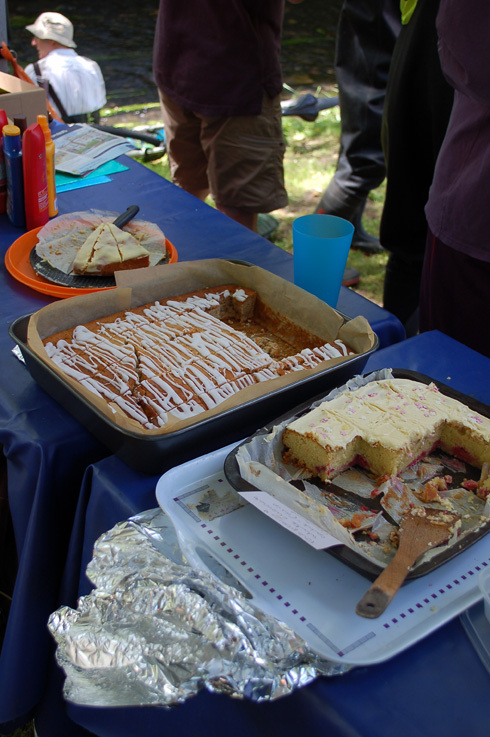 Ann’s car wouldn’t start that morning, however, she kept her cool, called for breakdown assistance, and her sultana cake and shortbread biscuits were a triumph. After lunch we concentrated our efforts on the stretch of water just below the islet that juts out below the Trewint Street bridge. especially Selena from the American University who, on her quest to find a motorbike, got completely soaked and didn’t have a change of clothes to go home in. What must her fellow passengers on the train have thought! 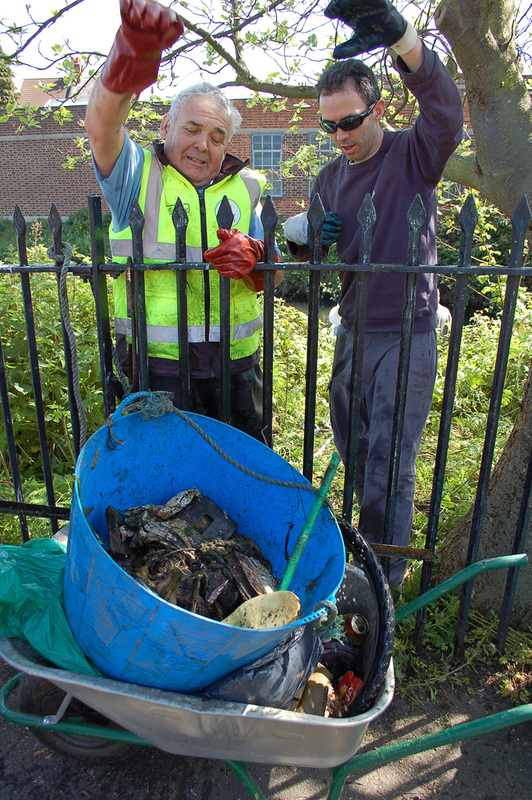 Our thanks go to Joanna of Wandsworth’s waste management team who arranged collection of all the rubbish. 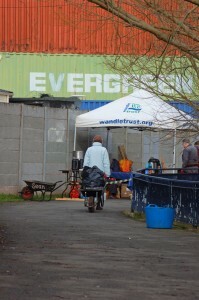 Thanks too to Richard who let us use the loos in the warehouse office, to Gideon who helped load up the van and to AJ who cycled to the garage to help unload. 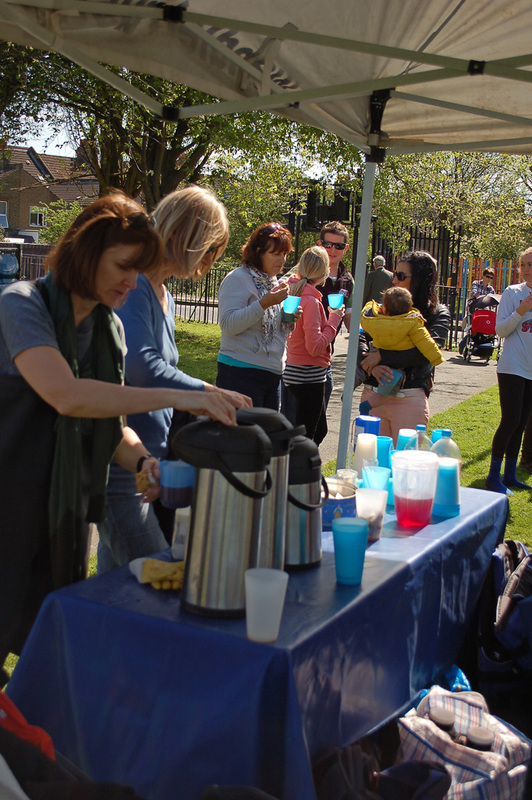 Thanks to all our volunteers: AJ, Adam, Adele, Alex R, Alex S-S, Alexandra, Andres, Andryana, Ann, Annic, Barry, Bayan, Beatriz, Bella, Ben, Bim, Blendina, Caden, Charles, Colin, Elliot, Emilia, Emily, Flavio, Francesca, Gideon, Harry, Hugh, Jamie, Jan, Jana, Jennifer, Jo, John, Jonathan, Julian, Justin, Katie, Ken, Louise, Luko, Madeleine, Nihan, Noughan, Oceane, Olufunke, Patrick B, Patrick J, Paul, Peter, Philip, Prince, Rayhan, Rob, Robert, Roger, Romina, Rose, Sally, Sally Ann, Sandra, Selena, Shepherd, Simon, Theo, Tim, Tosin, Valentin, Victoria, Vincent , Wally, Wayne and Will. 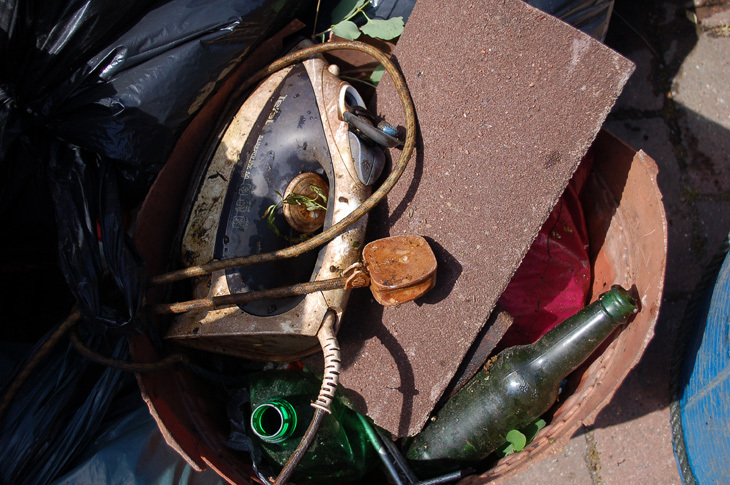 Who removed: 1 small safe, 1 tumble dryer, 1 electric fan, 1 paintbrush, 1 toy car, 1 toilet, 1 bicycle, 1 office chair, 1 buggy, 1 hanging basket, 1 wheelbarrow frame, 1 air conditioner, 1 child’s scooter, 1 shower curtain, 1 road cone, 1 sink, 1 headboard, 1 metal box, 1 rubbish bin, 1 shovel, 1 lock pick, 1 coal scuttle, 2 coconuts, 2 LCD televisions, 2 exhaust pipes, 2 hub caps, 2 car mats, 2 telephones, 2 hobs, 3 carpets, 3 vacuum cleaners, 3 metal pipes, 4 tyres and 40 rubbish bags full of miscellaneous litter including credit cards, clothes, and shoes. 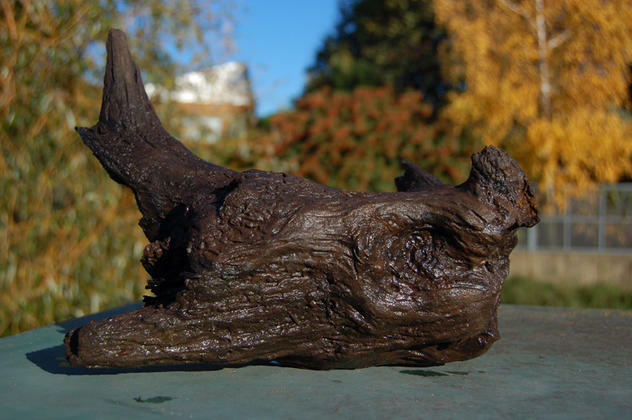 Oh, and a piece of wood which resembled the head of a rhinoceros. 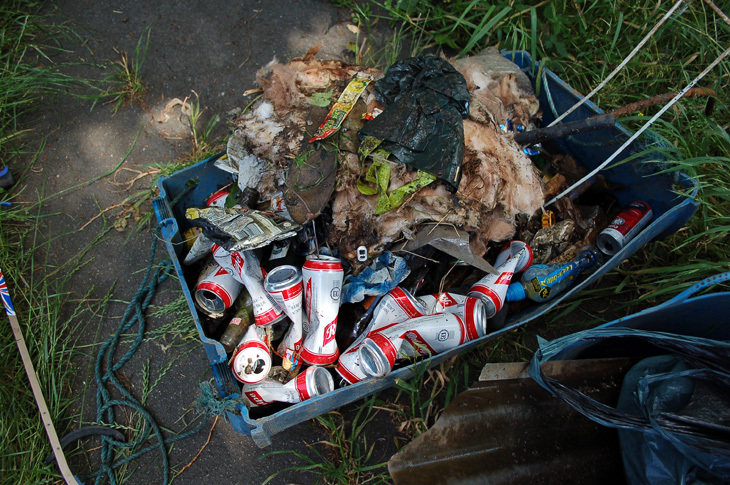 Update: this cleanup has now been reported by our local media. 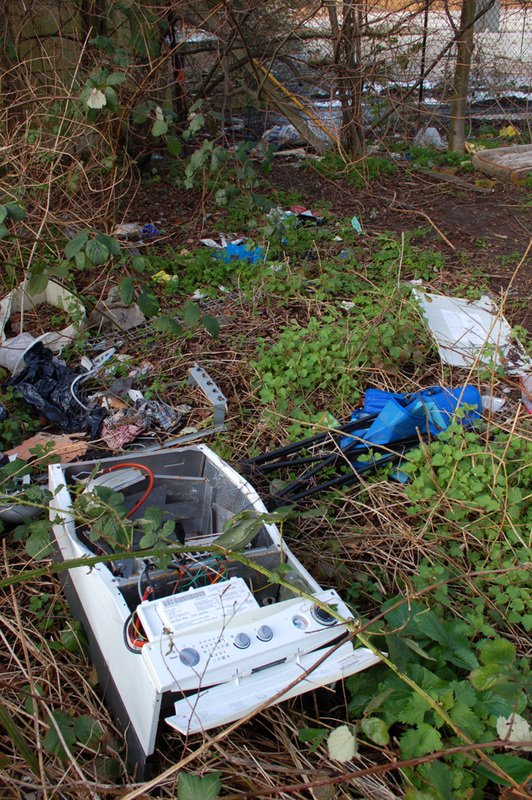 This entry was posted in Uncategorized and tagged Cleanups, Events, Wandle on November 17, 2013 by Erica.